The Park Hotels, are well known for their fine quality standards while entertaining their guests with the very best. 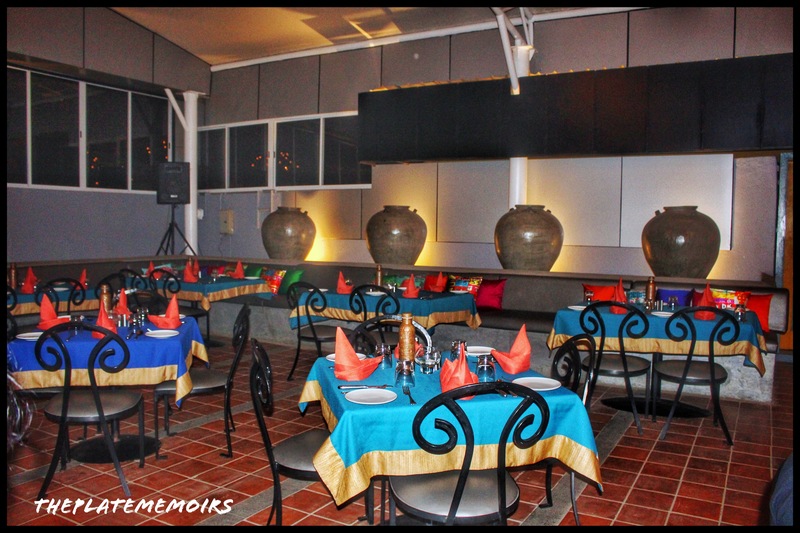 “Monsoon” encompasses that very trait, it is a fine dine 24 hour restaurant that is proffering a spread of ” Italian & Pan-Indian” fare. Located at a prime location, stones throw away from a premium mall, Monsoon, is a perfect getaway if you are in the vicinity. 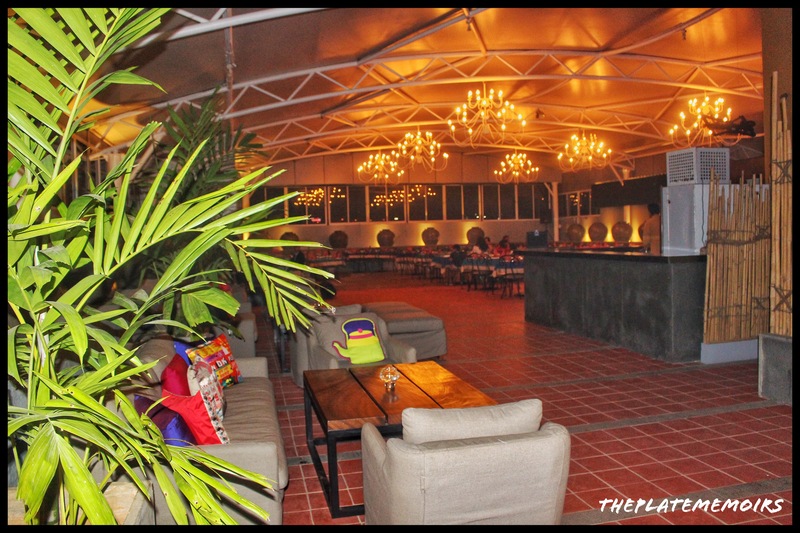 The ambiance is an amalgamation of laid back & relaxing. The colour scheme, is a beautiful deep toned brown with specks of green, which instantly give you a cozy feel. The slow tempo of the music in the background, also helps you shrug off the cacophonous chatter in your mind. 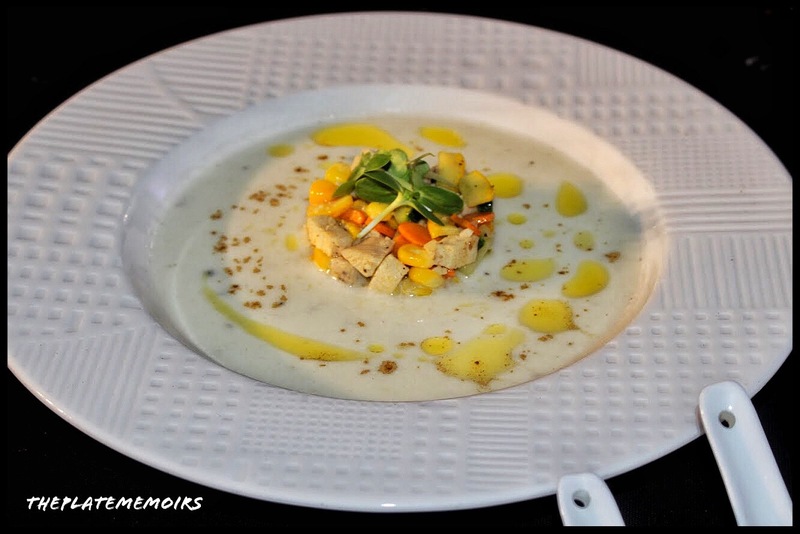 Being a vegetarian, I went for the “warm creamy mushroom soup”. I, kid you not.. it was by far, the most delish mushroom soup I’ve had. They had quite a few salads, but my favourite was the “Japanese Salad”, which was foamy soft with sour cream as the dressing. It had tangerines, lettuce & veggies. Mind blowing yum. The had the option of unlimited iced coffee or pineapple juice. I, chose the coffee of course. 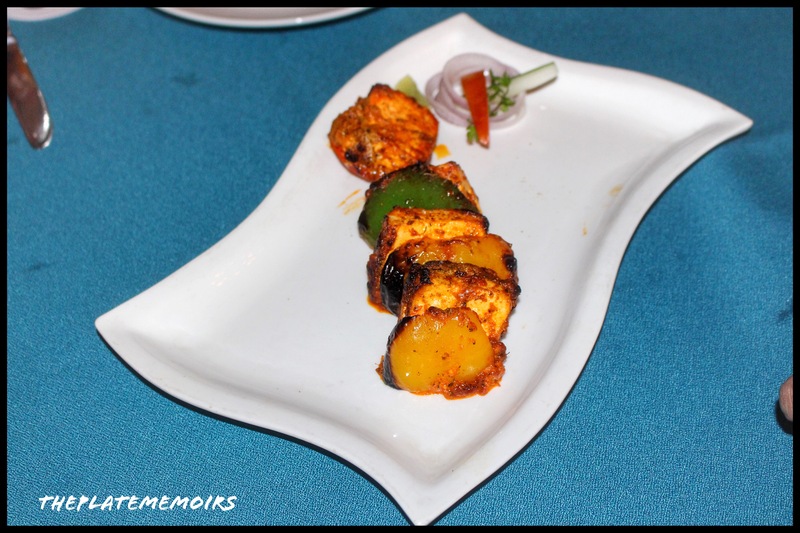 Paneer Tikka : Beautifully marinated squares of Paneer coated with the Masala & tandoored. 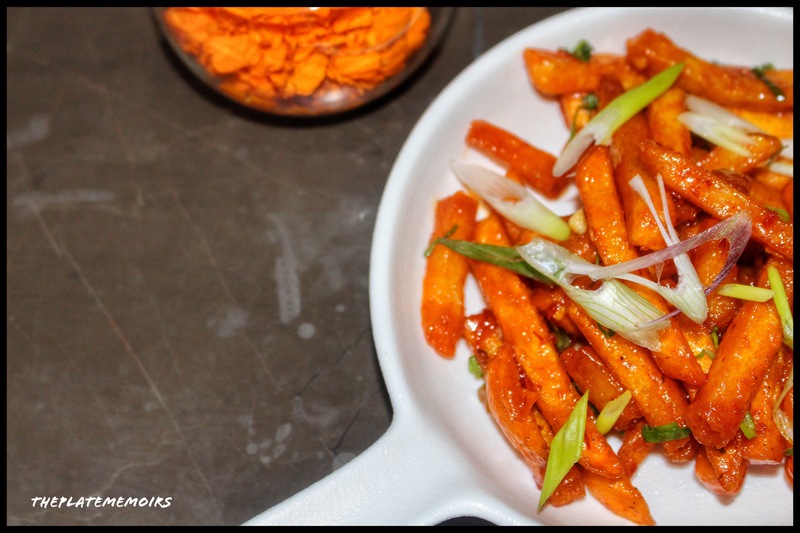 Honey Chilli Potato: The slender Potato fries were tossed in a sweet spicy sauce. Delectable much. 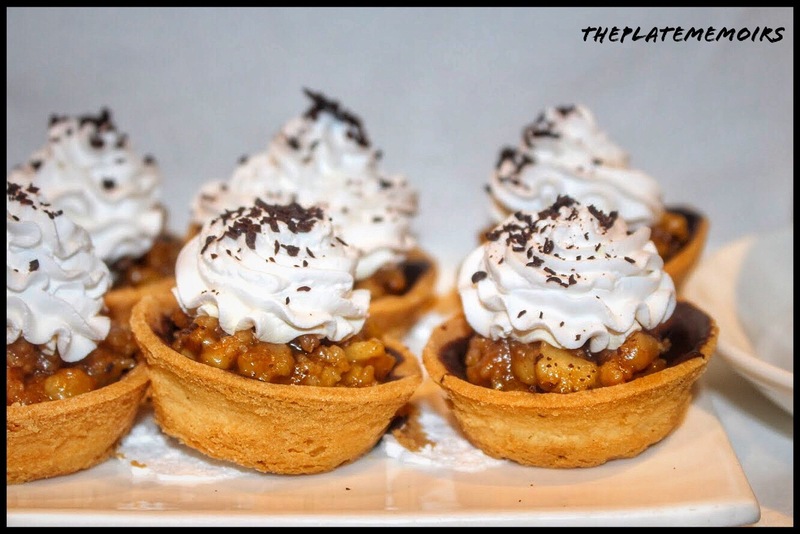 Walnut tart with whipped cream: Trust me, the pastry was melt in the mouth. Crumbled into the mouth & was overtly delish. 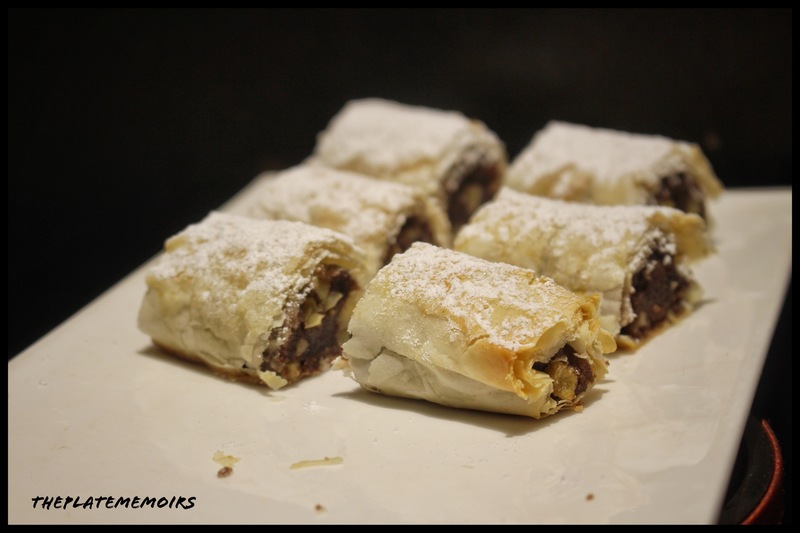 Apple Strudel : Done ever so lightly with the flaky phyllo pastry and with the slightest hints of cinnamon. This made my day. 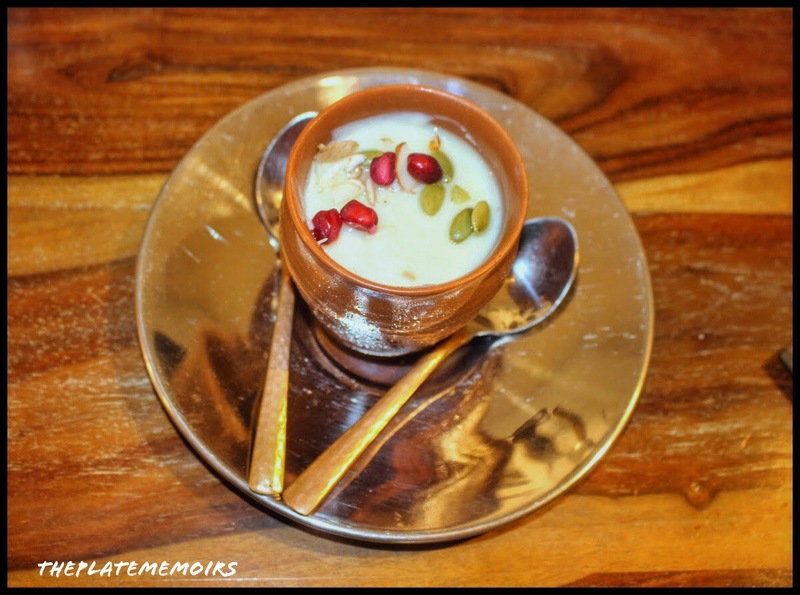 Apple cream Yoghurt: Another masterpiece, with light flavours but powerful punches. 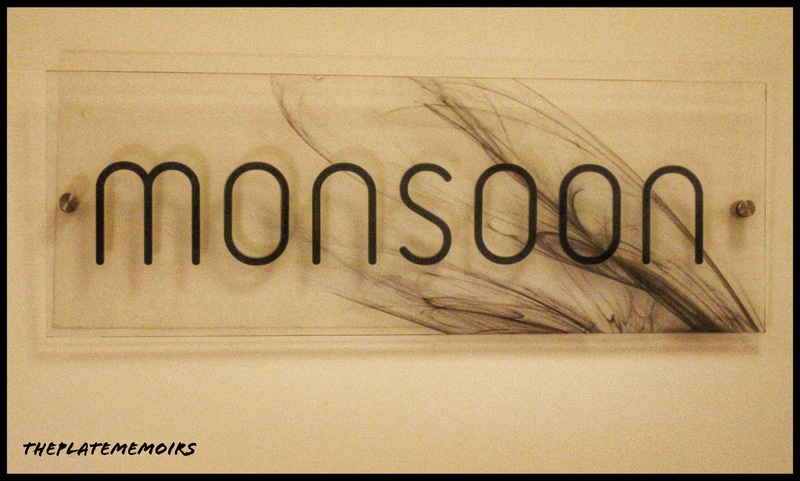 Verdict : The dinner buffet at Monsoon, was a total heartwarming feast, with not one dish being below average. 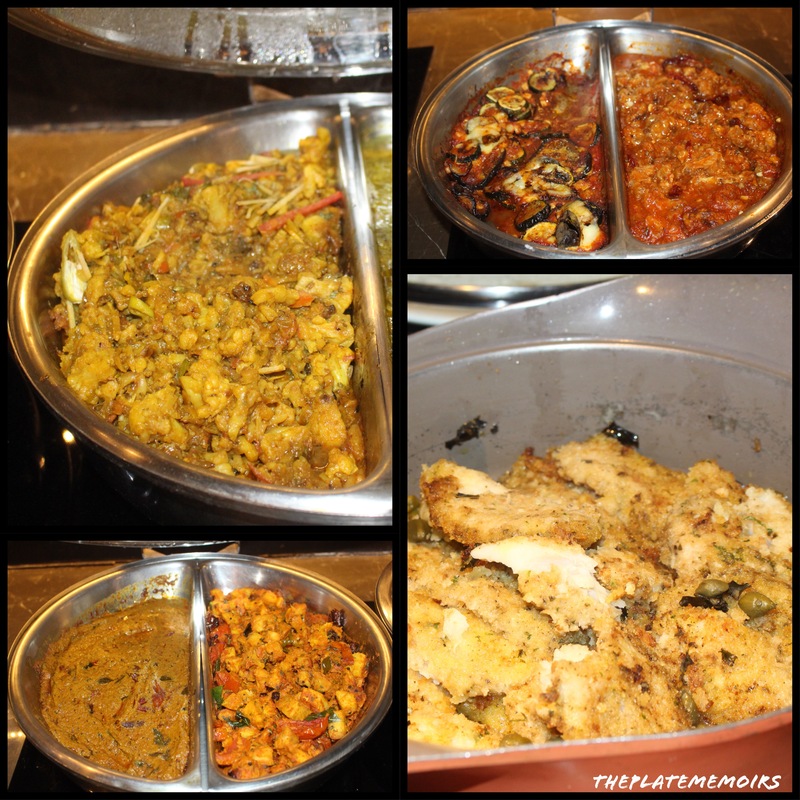 The emphasis is more on heroing elements and there isn’t a purge of too many flavours. Food stands tall & is absolutely worth the spot on pricing. Rates absolutely reasonable on the VFM meter. Priced at ₹1700/- for two (dinner buffet) that’s about ₹850/- per head. Please tell Jack, somebody, that I’m echoing his sentiments. Unaware, of the fact that this evening would unfold something more than just food & professional conversations, i put on my best mascara, just so that people would see me wide awake. Spoiler Alert : One of the best evenings, filled with memories. Clicktable, is a “Restaurant Booking” app designed to make your dine in experiences, much more easier & benefitting to you. While, we are stuck in our realms of reality, finding time for the simplest things in life becomes cumbersome. 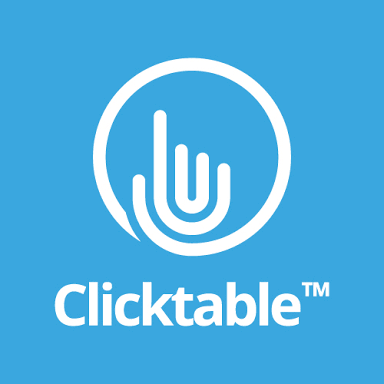 Clicktable, makes your life much easier, with the tap of a few buttons. 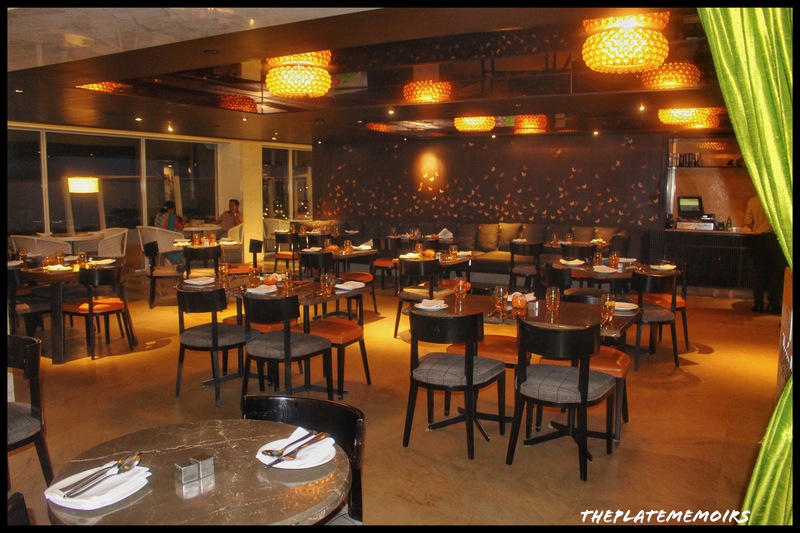 You can book your table at your favourite restaurant & avail great discounts as well. So, it’s time to say goodbye to long queues & unnecessary calls to restaurants asking them to reserve a table for you. It’s a fairly new entrant, which tries to capture the essence of being a fashion bar. The restaurant, is nothing short of special because of their offerings. 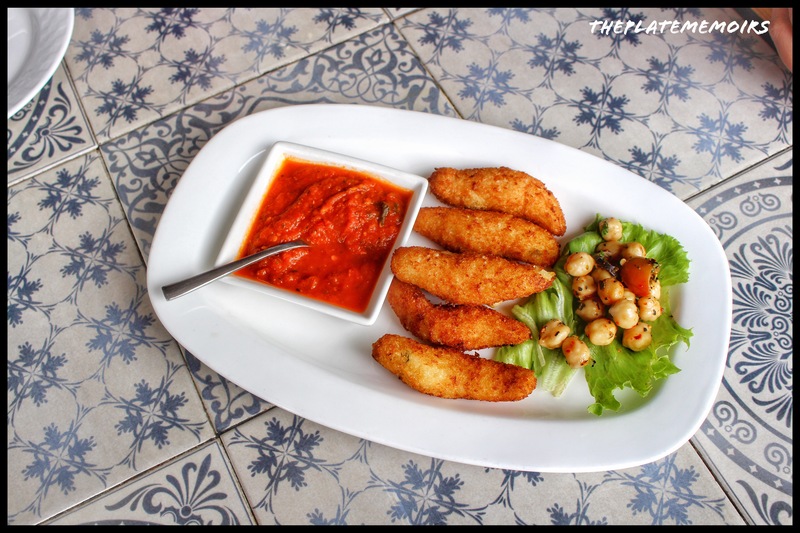 The cuisine is Spanish, European, Indian & Fusion. You can expect flecks of molecular gastronomy as well. I, really enjoy a relaxing ambiance yet mellowed down ambiance. 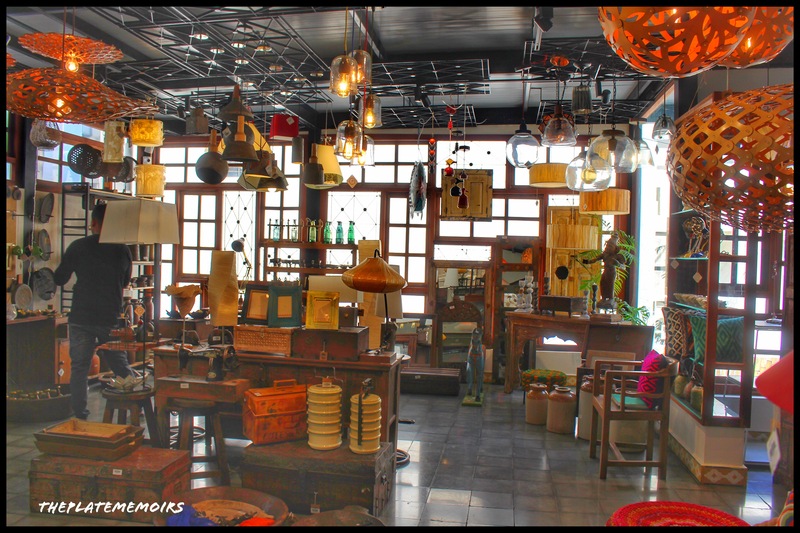 Though Xu, has a peppy and well thought eclectic ambiance, it didn’t fail to keep me entertained. It also rates high on comfort factors. 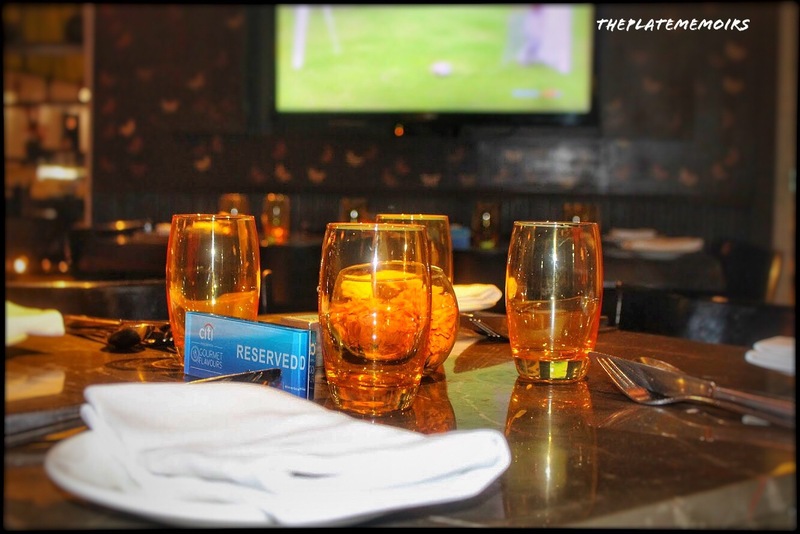 The staff, is highly well versed with the menu and they do give you good suggestions on what must be ordered. 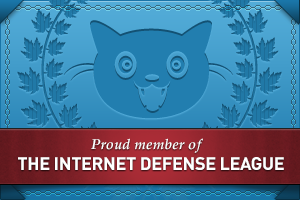 The service is a little slow, but there is lots of room for improvement because it’s just launched. We were here for the Clicktable app meet, were we had an interactive session with the members about the inception & workings of the app. 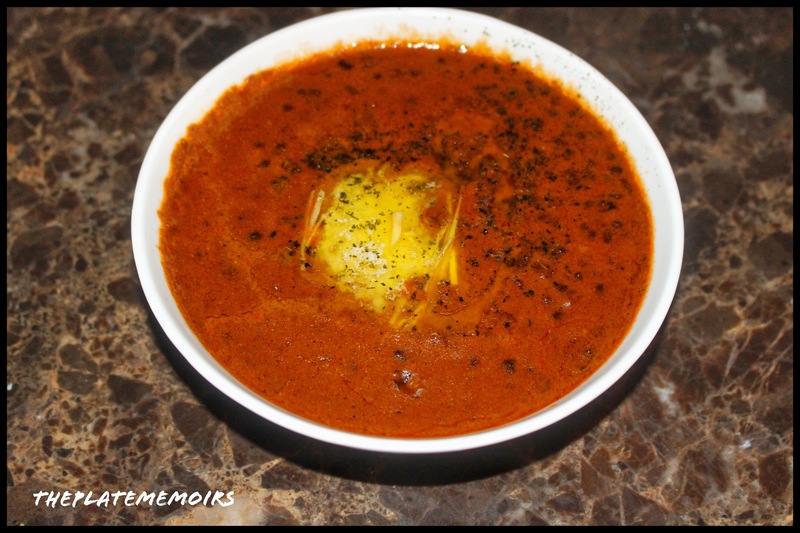 Deoxidised Gazapacho (₹230/-) : A light yet hearty soup made out of Roma tomatoes, scallions & Smooth Brie. I, enjoyed the refreshing taste immensely. 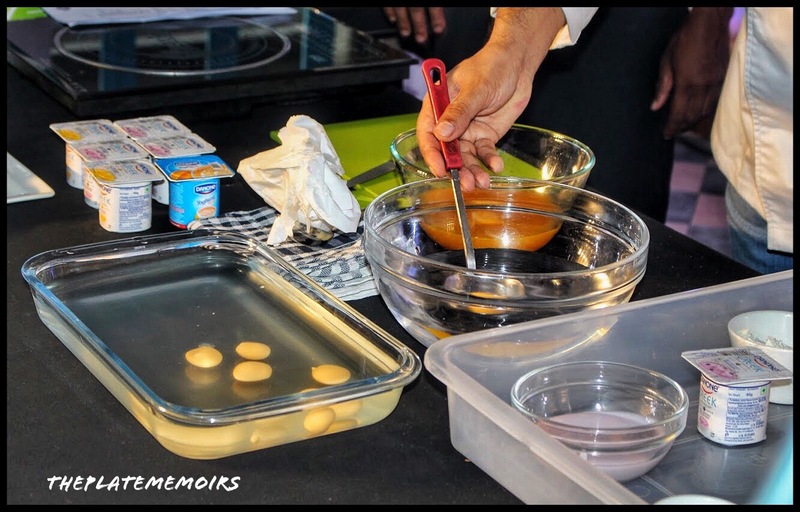 Creme di Bisibele bath (₹170/-) : Dal Tadka savarin with phulkas. Definitely a must try. 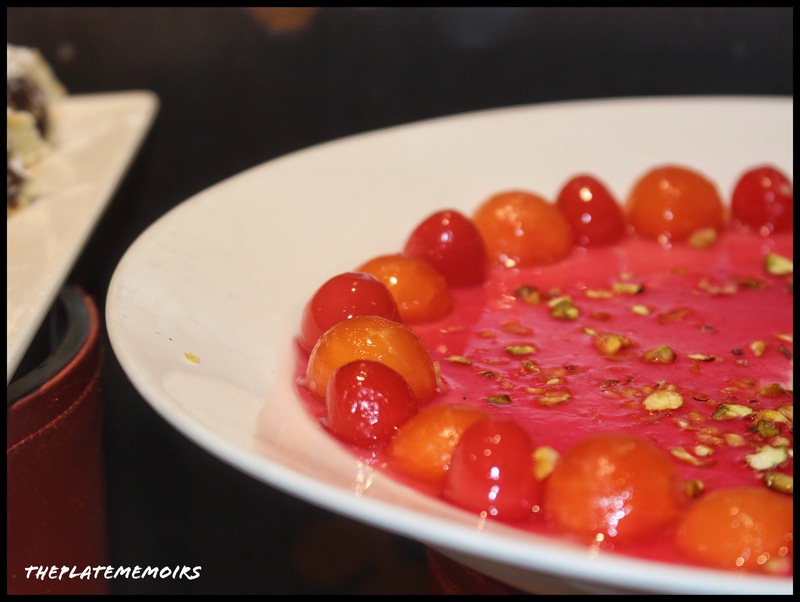 Quenching Catalian (₹285/-): Watermelon triangles served with feta quenelles & mint raspberry coulis. I, kid you not, it was one of the best salads ever. Period. Magnificent Malai (₹260/-): Deiciius and melt in the mouth, these Labneh Kebab were my favourite. 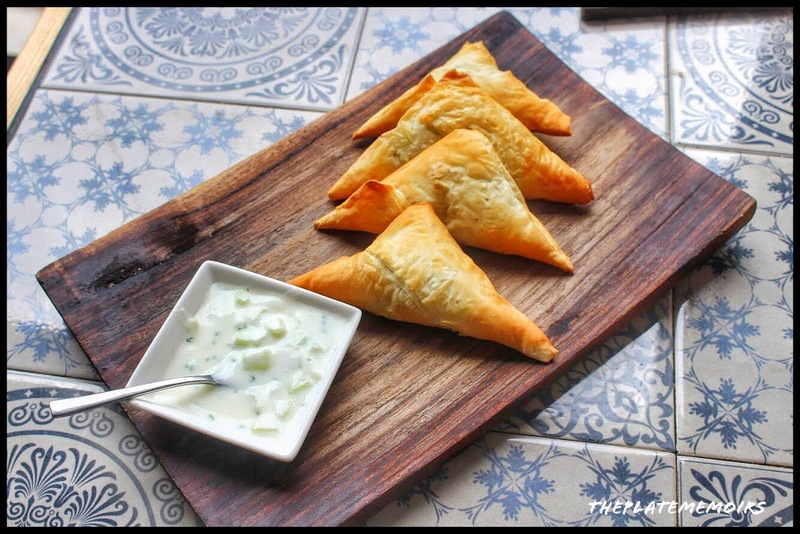 Flavoured with rose powder & cilantro oil. Very unique in composition. 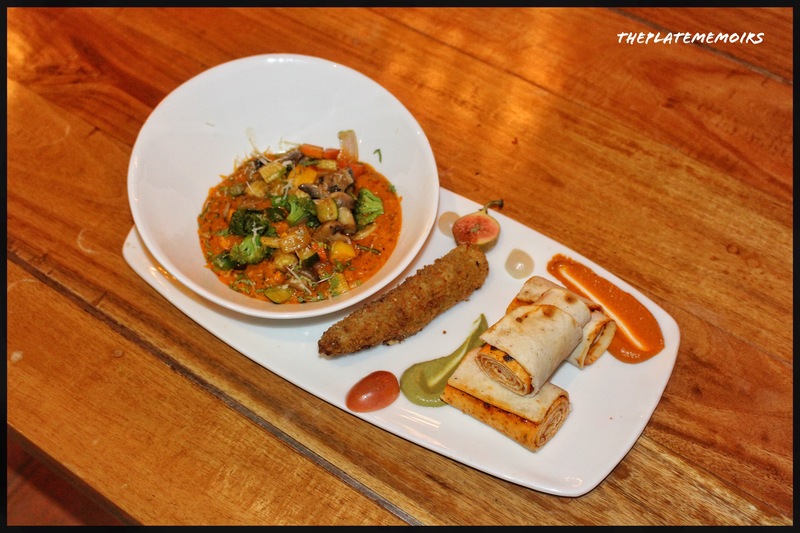 Indian Sushi : A beautiful fusion of cultures. 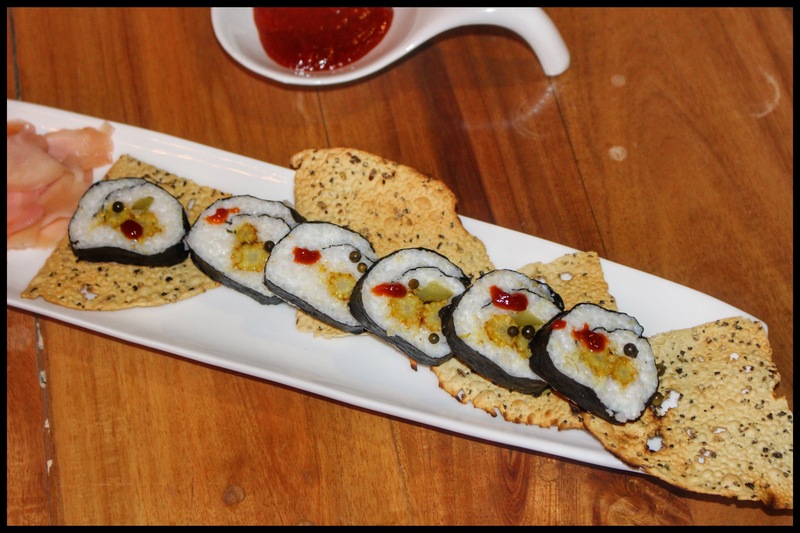 Curd rice sushi, with wasabi and befitting in taste. It could do with some more wasabi, but no complaints. 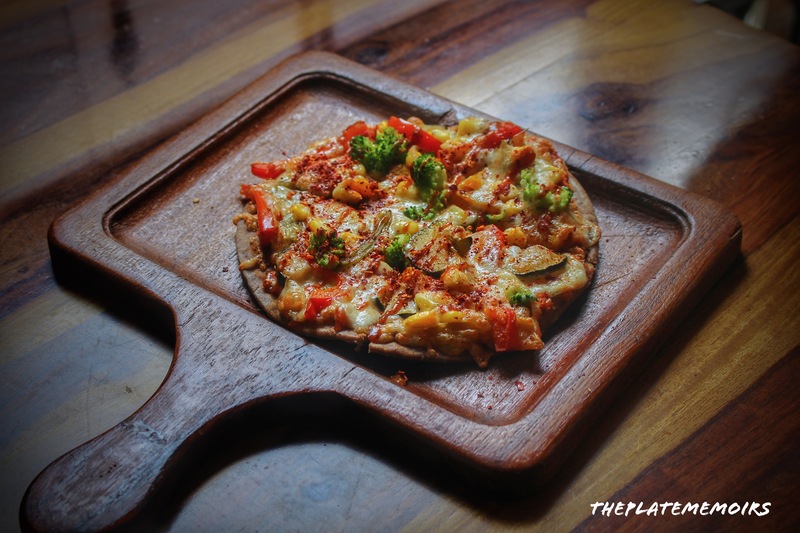 Nitro verduras (₹435/-): One of their signature pizza dishes, made out of sautéed veggies, jalapeños and nitro cheese foam. Extremely toothsome and filled with flavour. Bombay Bhajji Rolls (₹445/-): One of the best dishes of the day. The delish quotient was high on this one. The Bhajji was filled with mascarpone. Oh my Gawwwwd!! This was just genius. Worth every penny! Must must must try. Nitrosiana tart (₹200/-): Mysore Pak Tart with Shrikhand cheesecake. 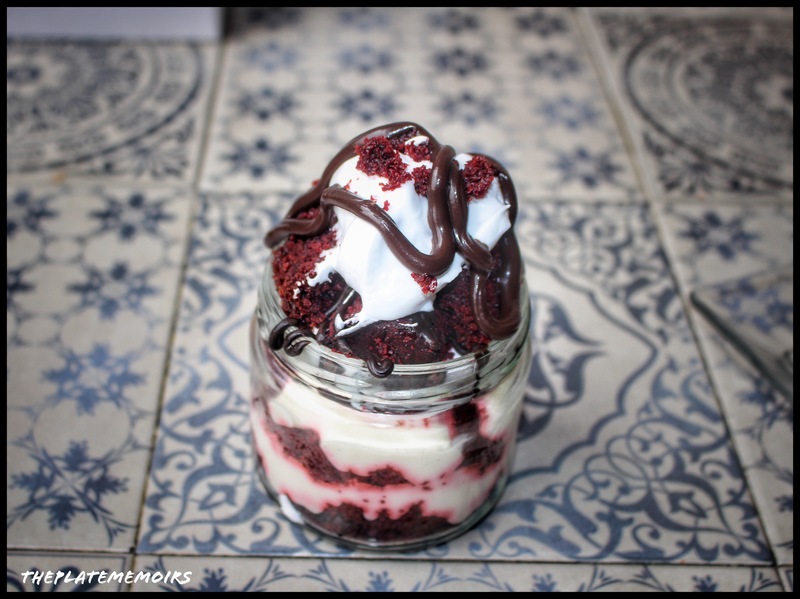 I’m in love with the concept & it’s something that titillates your taste buds. Petterossian Gavaroche (₹260/-) : Hazelnut mousse, aero sponge & creme anglaise. Another lipsmacking one. Verdict : The Restaurant is a pleasure to dine at. The food is ambrosial and unique. Rates high on VFM meter as well. Guess what, I ate a few slices of the pizza pretty much in the same vein. From its time in Naples, to it having reached every shore in the world (well pretty much every) Pizza, has come a long way. We have 100’s of versions, but the love for Pizza binds us all. It is as universal as it gets. 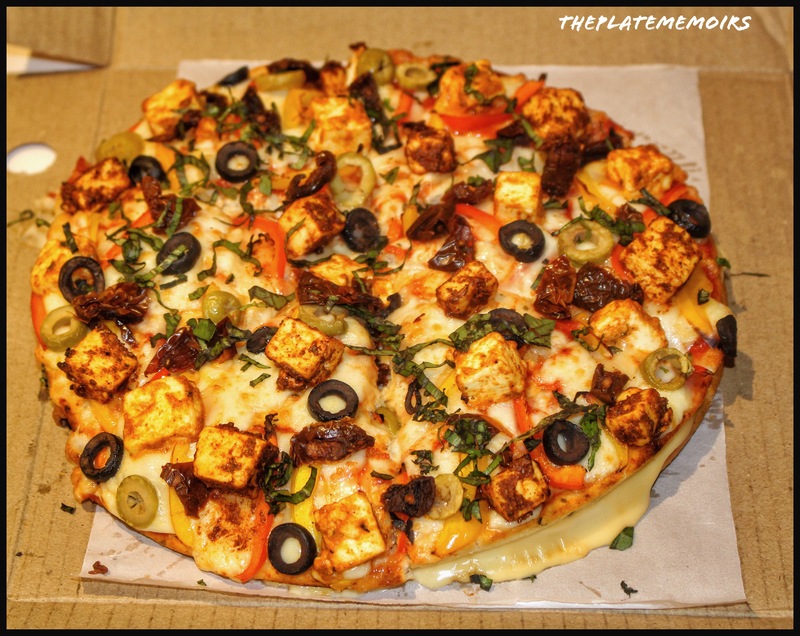 I’ve seen the Pizza revolution happen in Bangalore from the late 90’s, when we used to come back to India for our vacations and we would literally have no other option, but to go to the one place “P****H** to satiate our cravings. From then to today, when there are so many options and you’re spoiled for choice, you can’t help but think wisely about choosing which pizzeria to patronise. 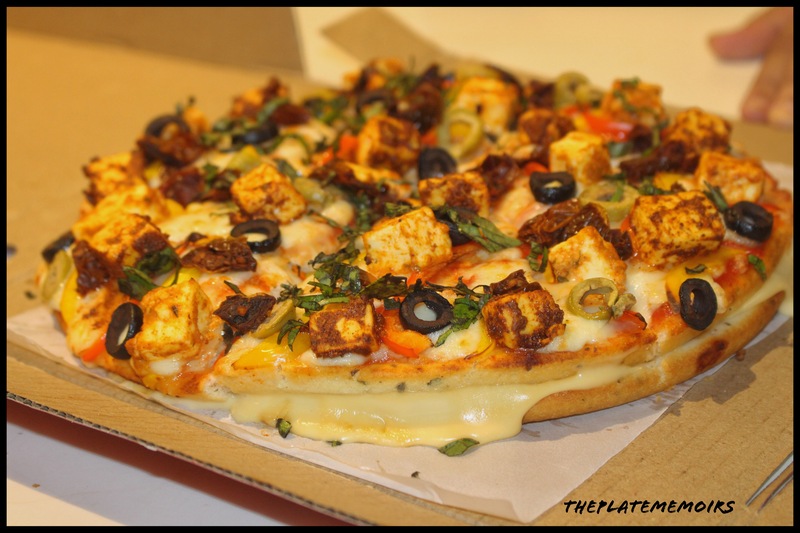 Whooppeezz, this QSR believes in giving you delectable pizzas at affordable prices. 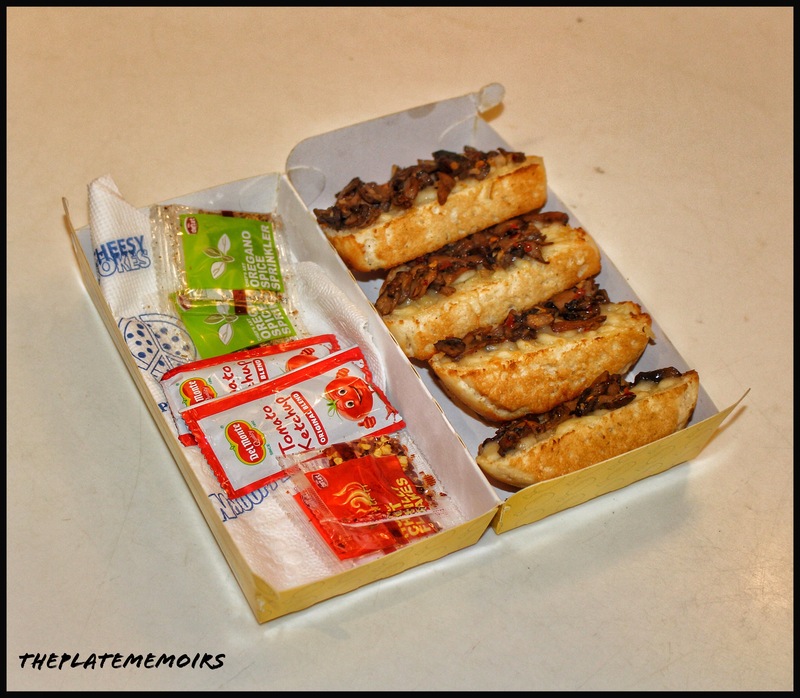 They believe in generosity and that is clearly seen, in their toppings & dousing of cheese. 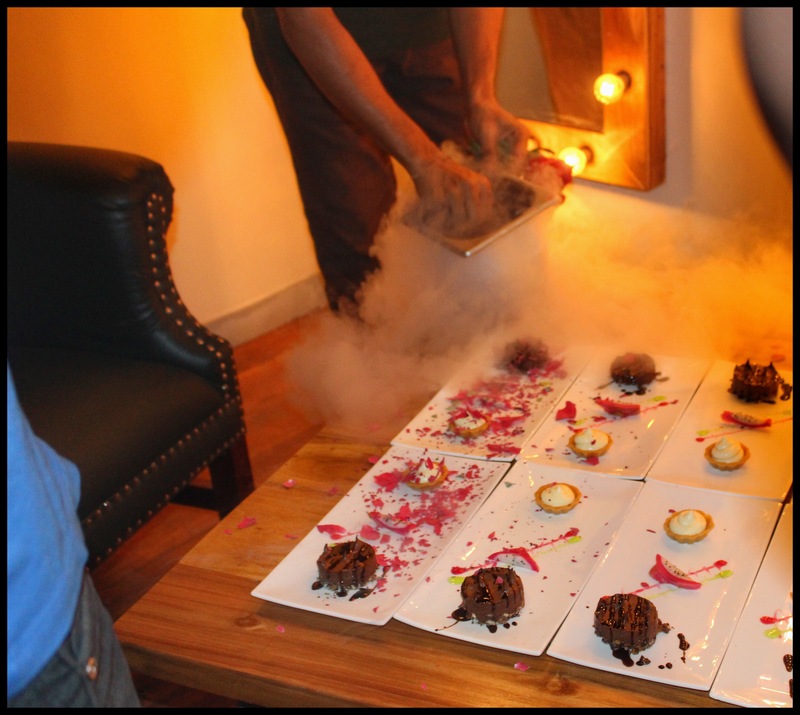 The take extreme care, making sure that you just had a lip smacking meal. Their brand mascot “Forgetful Franco”, is just someone you instantly can connect with. The ambiance, is pretty quirky and the catch phrases, catch your attention as well. Done with yellow and white tones, the ambiance is very cheery as well. Being a QSR, you really can’t expect much but they still try to be as involved as they can be with your dine in experience. 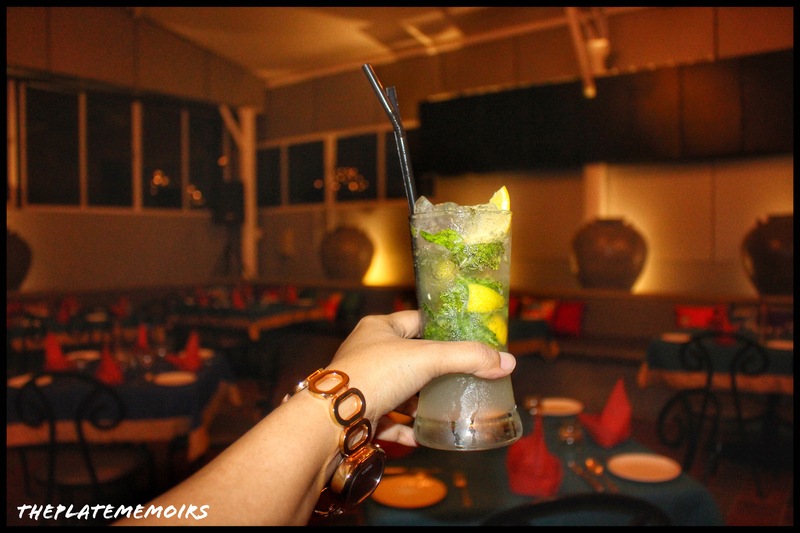 Virgin Mojito (₹79/-): Their mojito, was very refreshing and the punch of lemon & mint is pretty good. The best part is, it comes with your own takeaway bottle. ❤️ Affordable much. 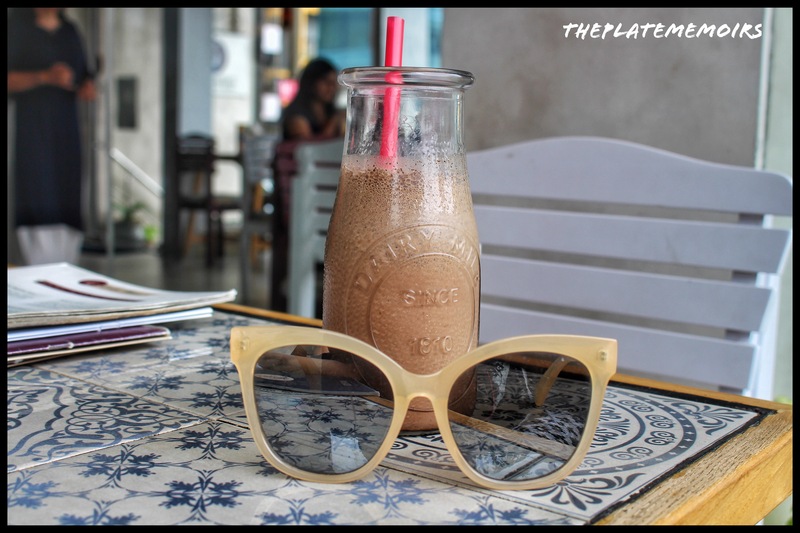 Crunch Choco Blast (₹130/-): Yum and a mouthful. 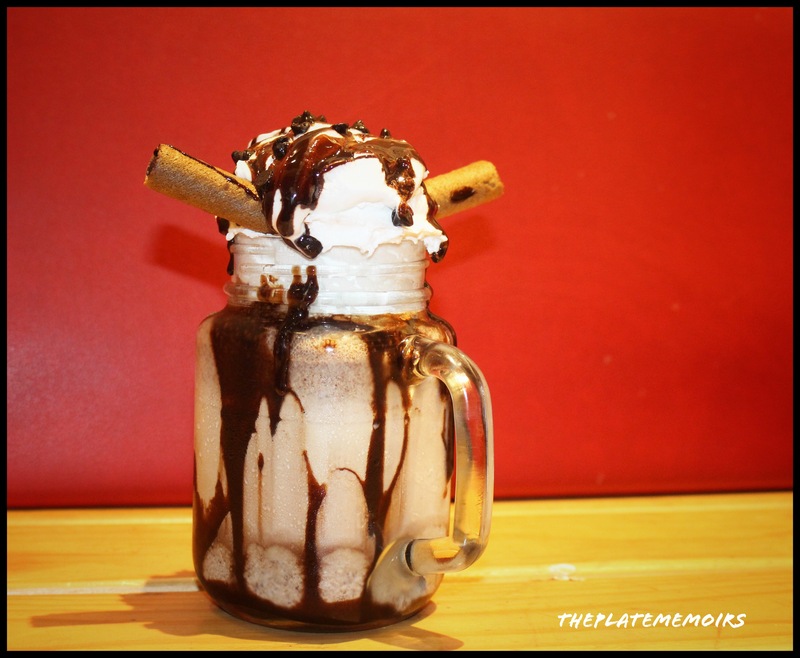 The delectable shake, was ever so rich and had all the elements of a freak shake at quarter the price. 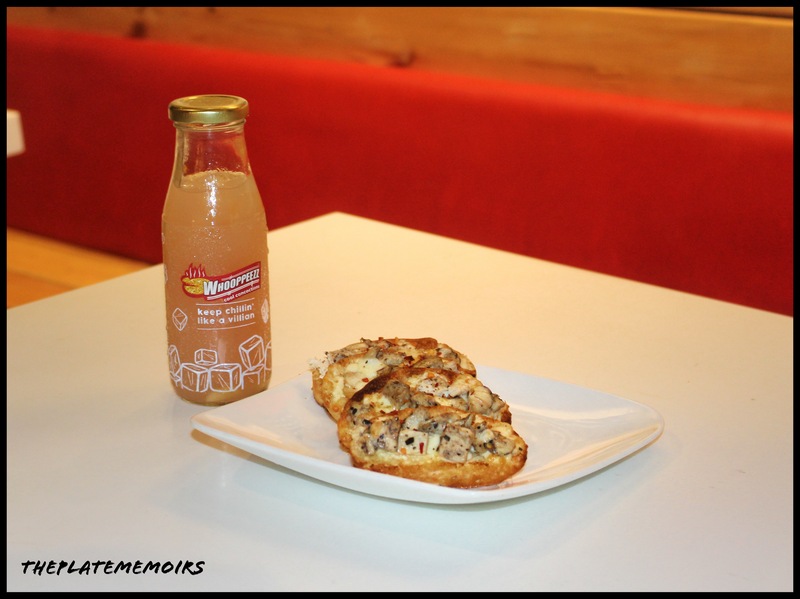 Garlic Bread With Cheese & Mushrooms (₹120/-): Quite surprisingly, this was really enjoyable. With a crunchy bruschetta, warm mushrooms & drippy cheese, I’d order this any day. 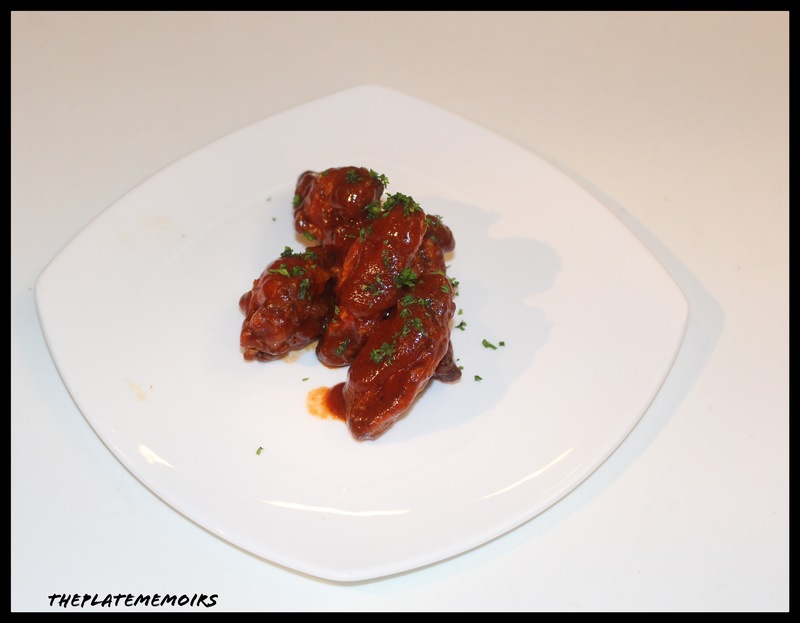 BBQ Chicken Wings : All of the non vegetarians, loved this. It has a distinct gooey and soft texture to it. Silli Chilli (₹515/- for large) : A spicy combination of cajun Paneer, yellow & red capsicum, pickled onions & chilli flakes. The tang of pickled onions is something welcomed. 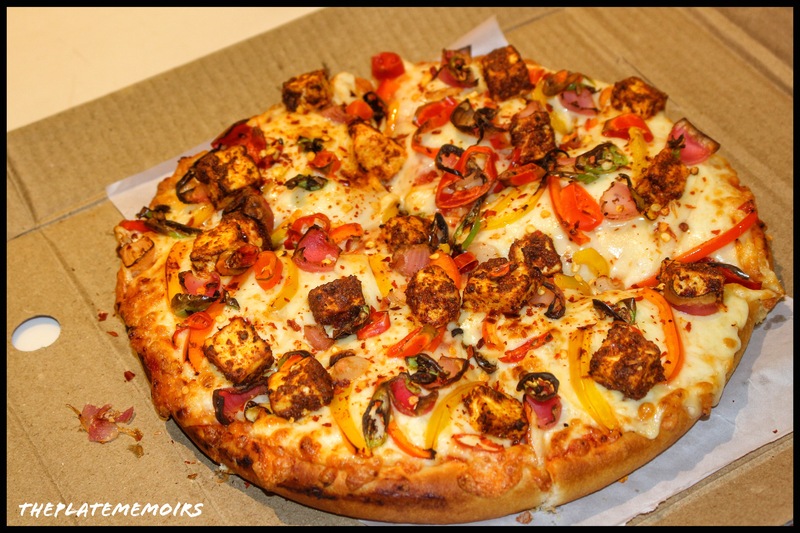 Veg Exotica (₹515/- for large) : If, you are vegetarian or not, this is one pizza that you shouldn’t miss for anything. The flavours of all those toppings, is just something so delicious. The thin crust, just elevated the flavours. 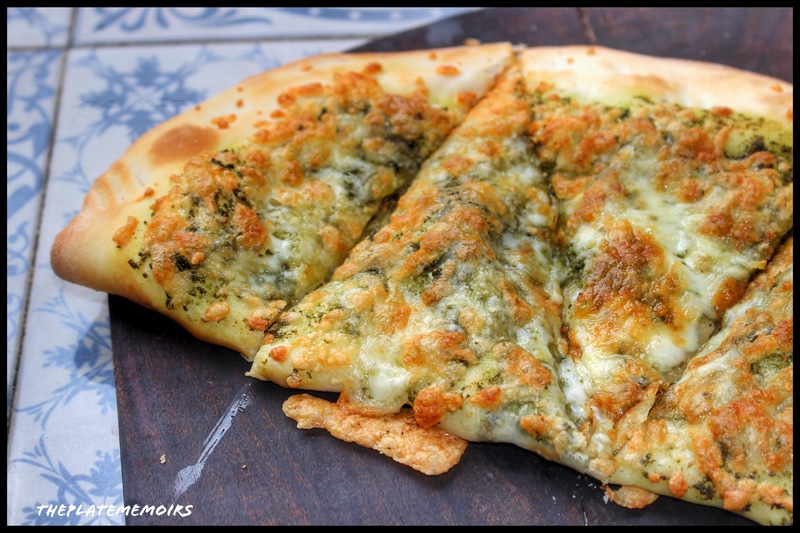 Popeye Spinachy : Made with a multigrain base and topped with spinach and cheese. This was my favourite. Loved it, must try! 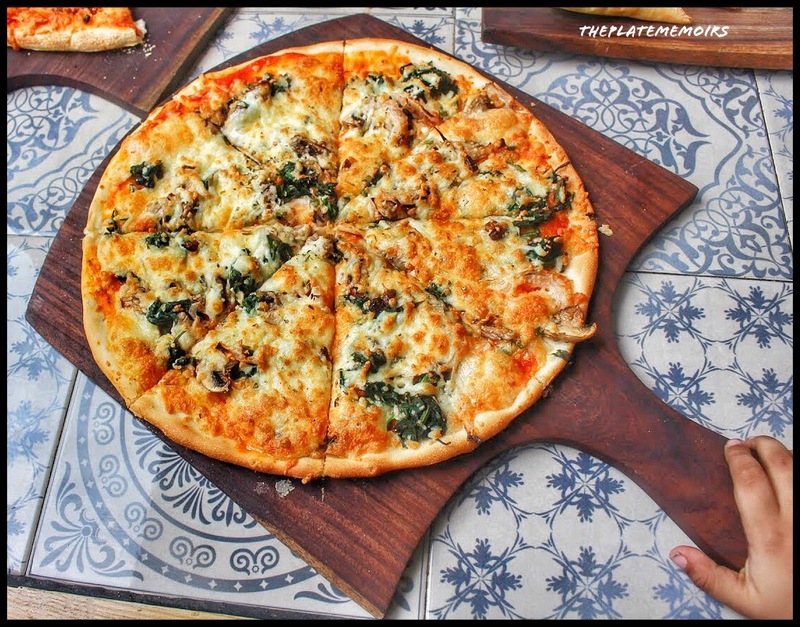 Mamas pizza (₹515/- for large): Sundried tomatoes, sautéed mushrooms and basil, this combination gets all the points for being sinfully yum. 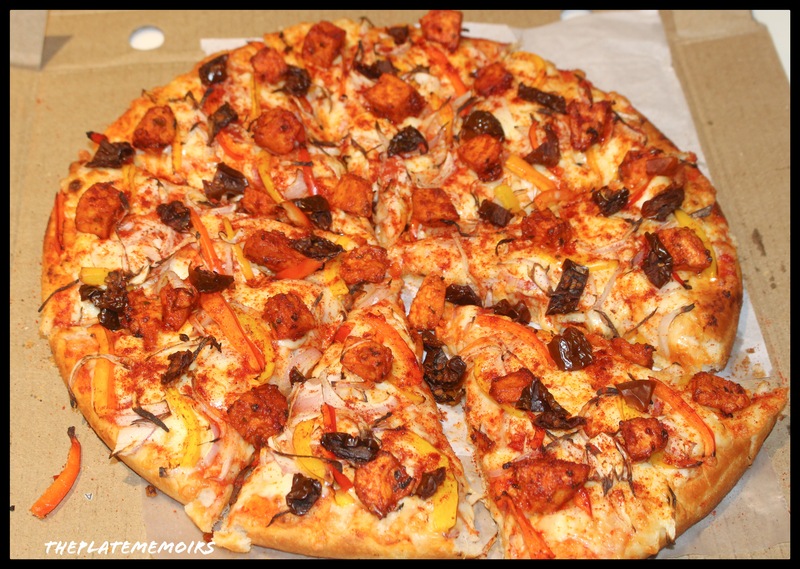 Whooppeezz Double Decker (₹550/- for veg): The mother of all pizzas, the monster munch and double the bliss. This pizza has a double of everything. 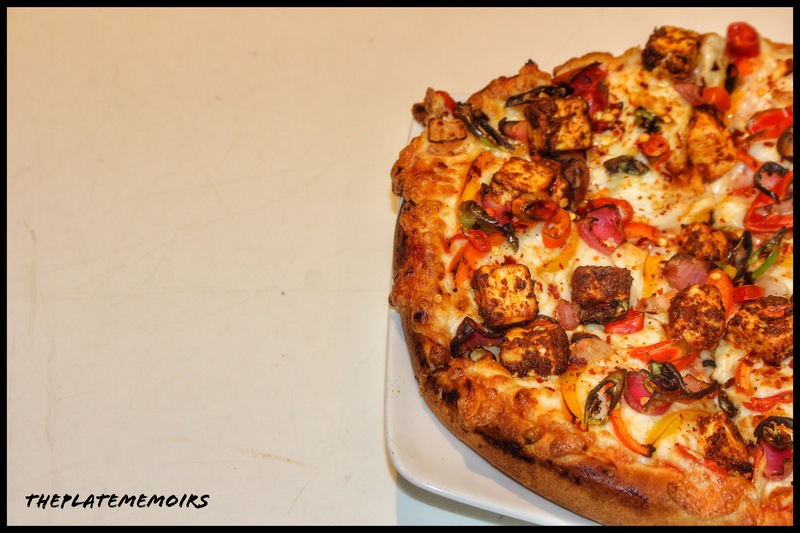 Cajun spiced Paneer, tandoori Paneer, black & green olives, sundried tomatoes & jalapeños. 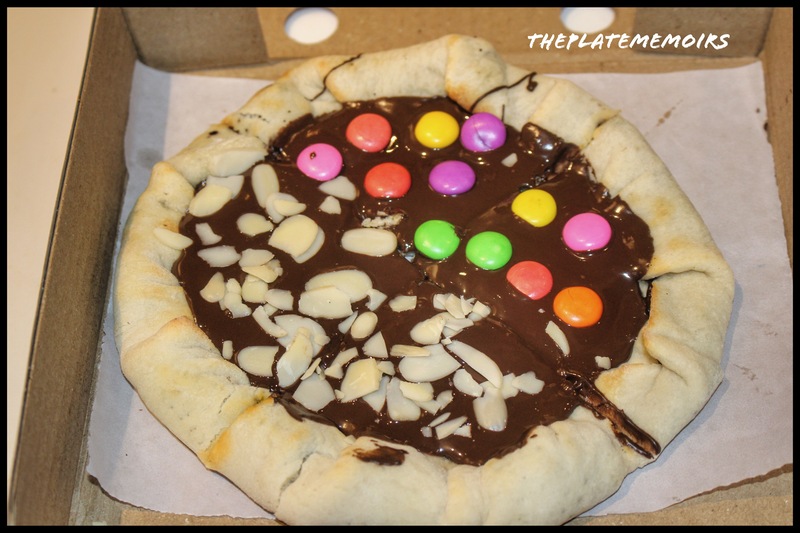 Whooppeezz Chocolate Pizza With Almond Flakes and Gems (₹190/-) : Omg!! This totally has to be heaven. 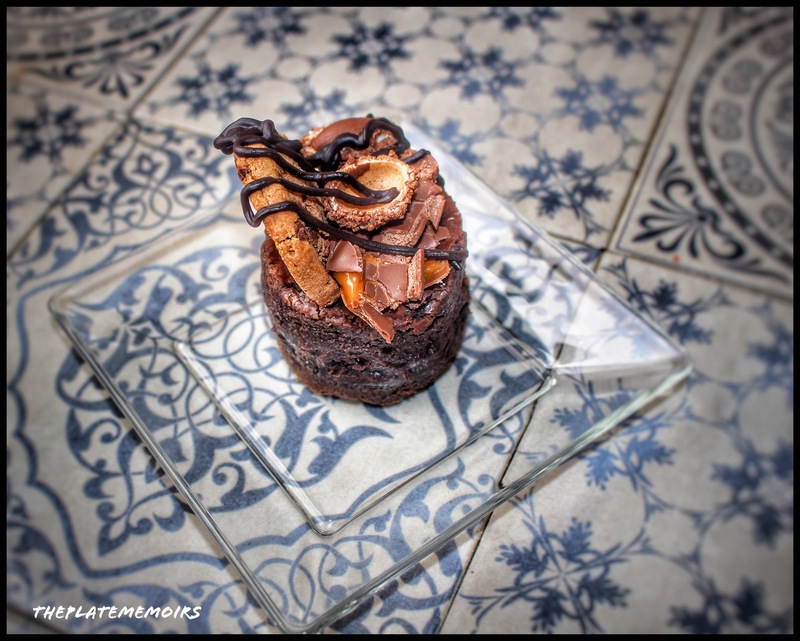 One of the innovative desserts I’ve had this month, the chocolate pizza is crunchy in the middle and spongy & soft near the crust and oozes of gooey chocolate. Must must have. 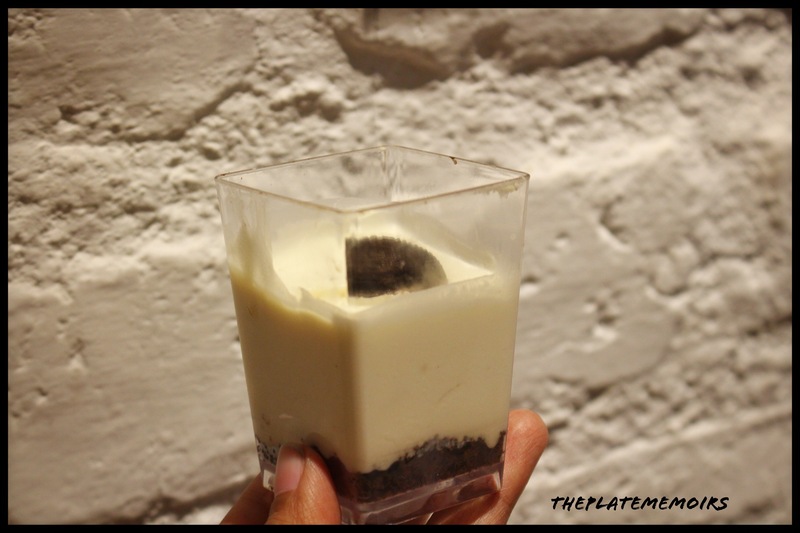 Choco Cheesecake Shot (₹60/-) : Smooth and silky, with a taste that envelopes you. It’s a highly yum shot, which the kids would love. Verdict : The pizzas and the offerings here are really a pleasure to devour. The pricing is good and rates high on VFM meter, there’s nothing that i didn’t like here. Here’s a 4 star for them. “ Good Food is very often, even most often, simple food”- Anthony Bourdain. Yes, I hear you Anthony. You don’t need some food brouhaha for it to actually be ambrosial. Something simple, well as simple as Pizza, can be the one that gets you. Situated in HSR, it seems almost like a piece of a Mediterranean noshery right here. 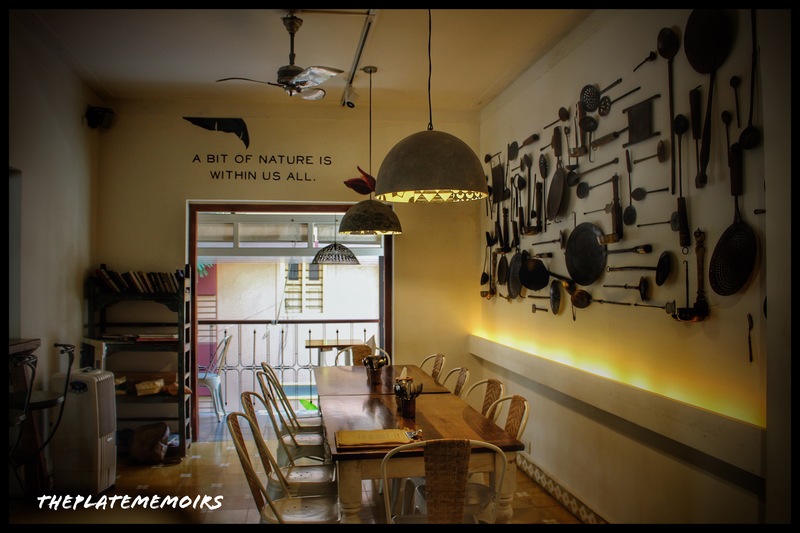 Grapevine is an ambitious venture started by the mother daughter duo, who believe in proferring, extremely affordable and lip smacking fare to whet your appetite. Ambiance: The ambiance, is extremely relaxing with the teal and grey tones to calm your senses down. The little baubles strewn across, take the feel of the restaurant up by many notches. It’s a place you come by, to lose yourself. Hospitality: The staff are well groomed and cordial, they could definitely do better with being a tad more attentive to the customers need. 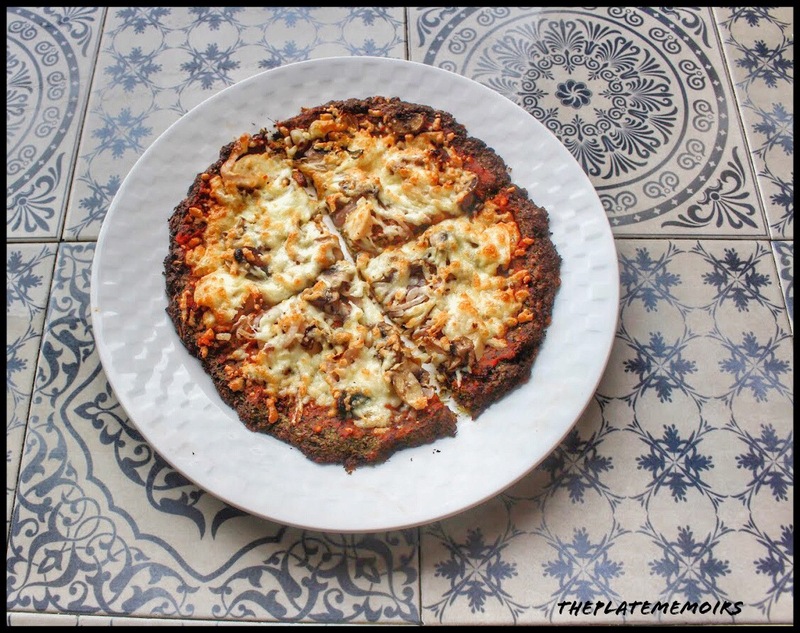 The Grub Story : Being “The Pizza Month”, there were quite a few pizzas that we ordered. 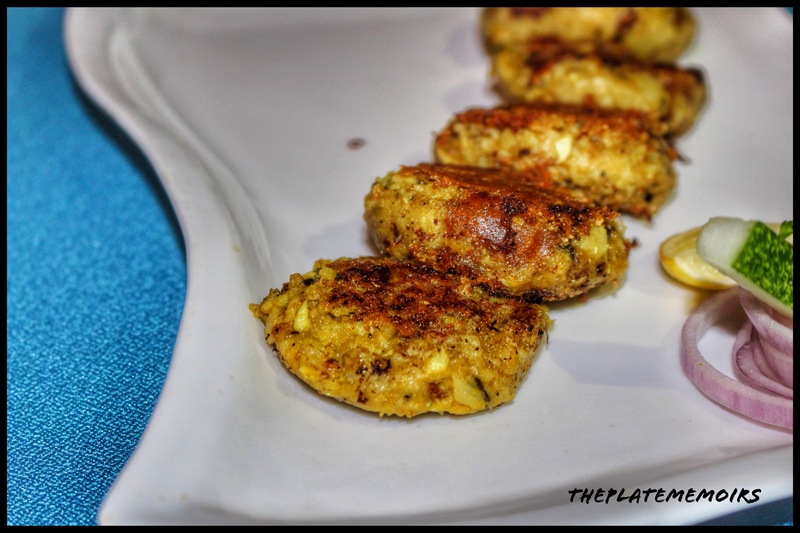 Cottage Cheese Croquettes (₹150/-) : A delicious strip of cottage cheese dipped in bread crumbs and fried. Loved the perfect crunchy exterior with the smoothness of that cheese. Must try. 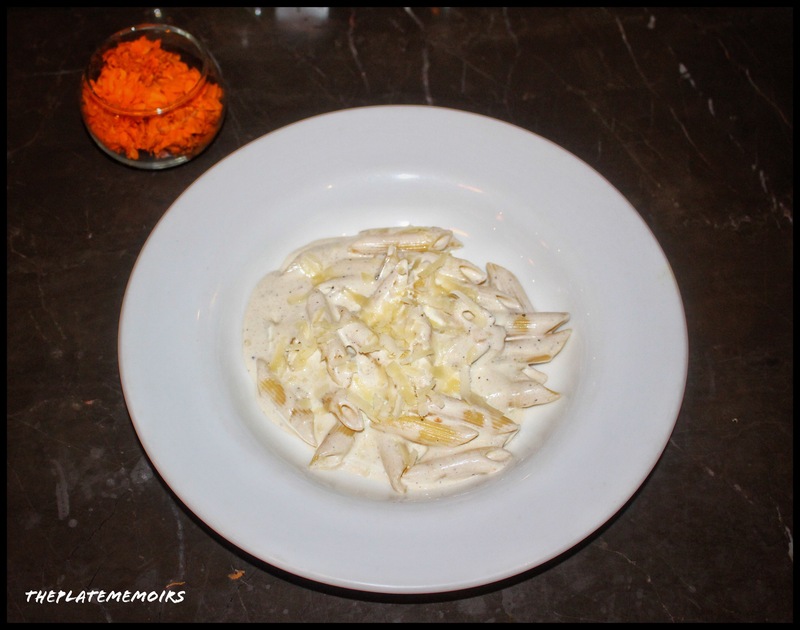 Penne in Mushroom and Thyme sauce (₹255/-) : Nice and lightly tossed in a delicate sauce with aromatic Thyme & creamy mushroom. 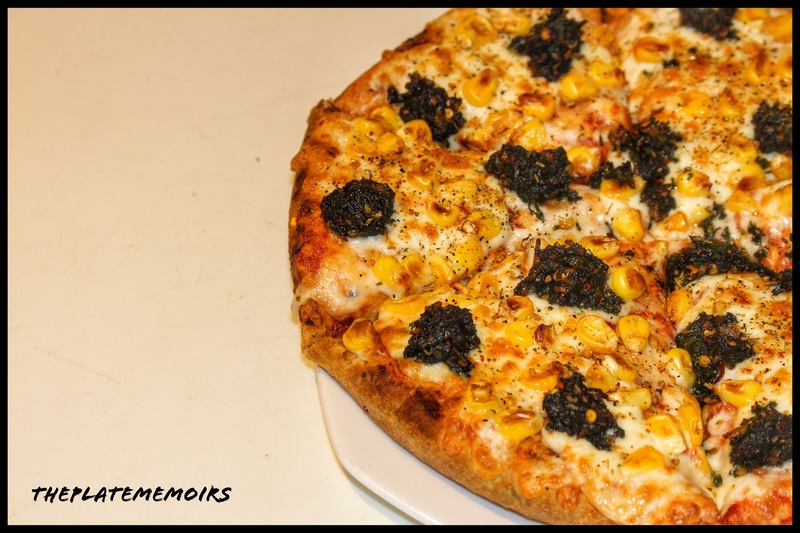 Mushroom & Burnt Garlic Pizza (₹235/-) : Oh! Goodness Gracious. What a delectable Pizza, with a thin yet soft base doused generously with mushroom & burnt garlic. Must try. 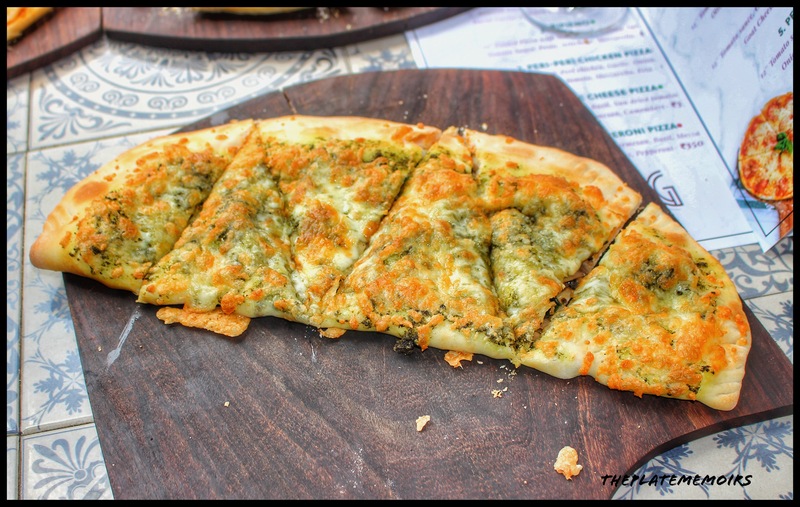 Gluten Free Broccoli Pizza : This was a new introduction into their menu. The base is…wait for it… made out of broccoli. I just can’t even tell you, how good this is. You really must try it to believe it. 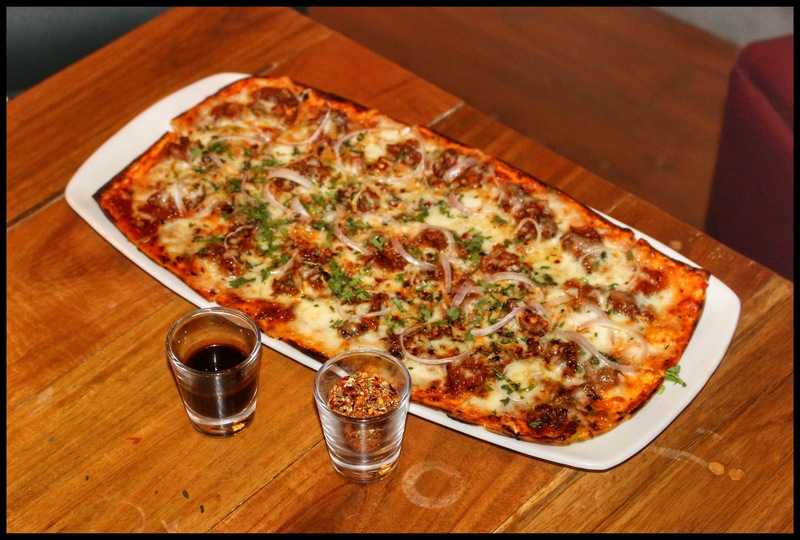 Ripieno (₹250/-) : It’s a Pizza folded in half and baked to perfection. I had the veg version, made out of spinach, feta & mozzarella. Must must must try. 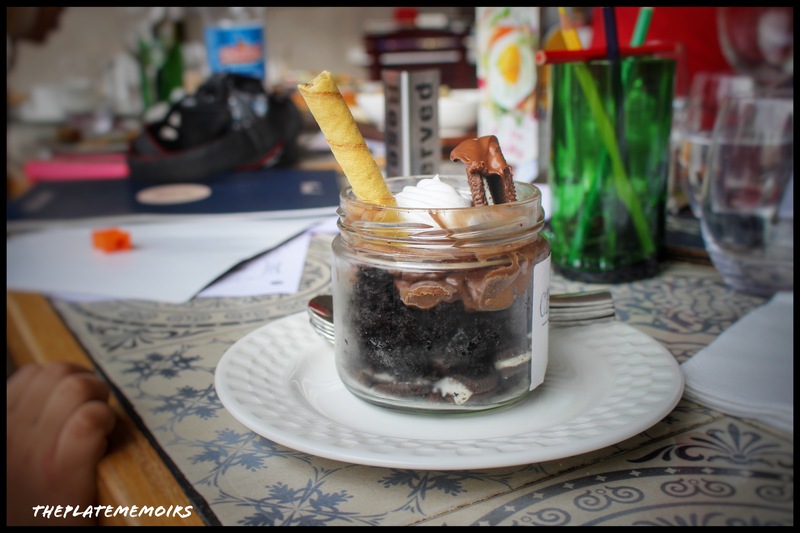 Brownie Shake (₹215/-) : Made out of chocolate syrup, brownie crumble and chocolate ice cream. A little more thickness would’ve taken this up by many notches, but nevertheless fair enough. 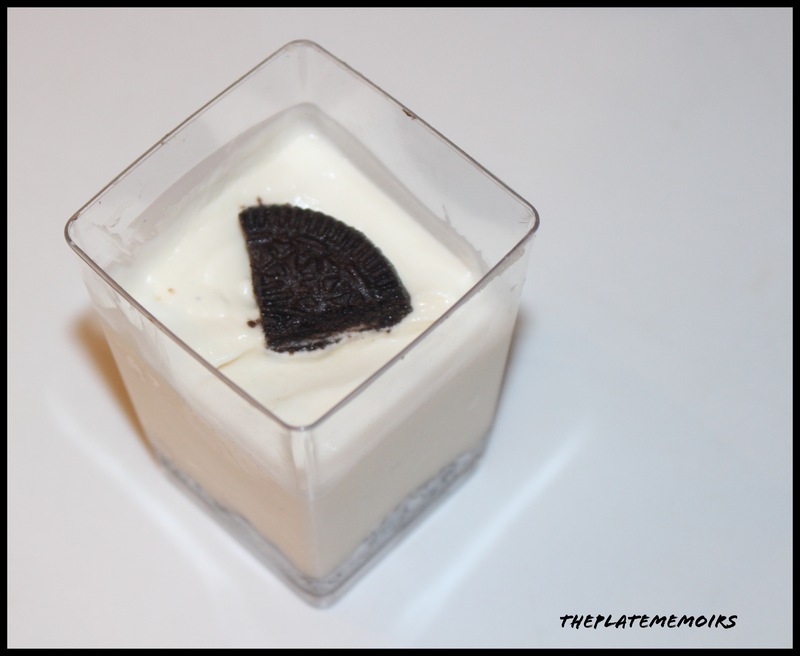 Nutella Oreo Cheesecake : They are collaborating their desserts, with “Cheesecake Alley”, and the desserts are just lip smacking. Here are a few others that I didn’t taste, but looked delicious. 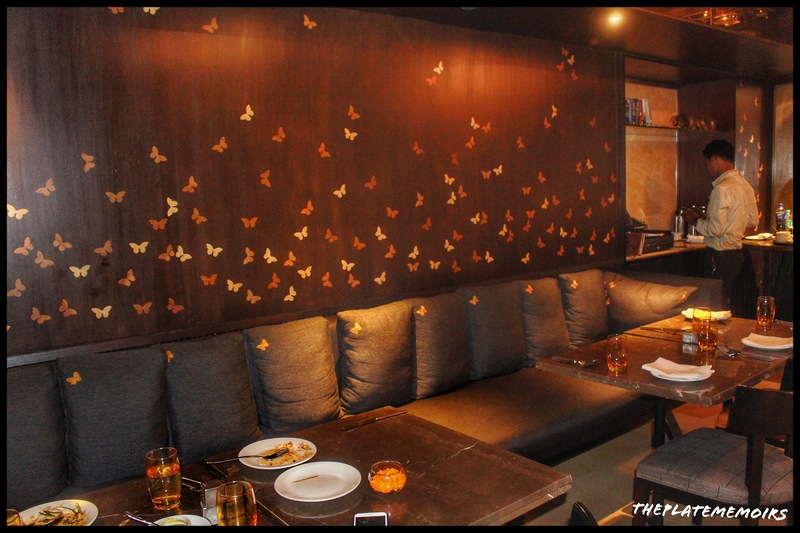 Verdict : It’s a perfect place to unwind and relax with good food. The VFM factor is fair. The Pizza month is on, don’t forget to go indulge yourself in it. You could also win a free pizza, if your table has a secret card. And, as i flopped down in my seat and helped my self to some second servings, Julia’s words rung true. It really isn’t always about being positively baroque all the time, sometimes you just crave for something analogous to your roots. 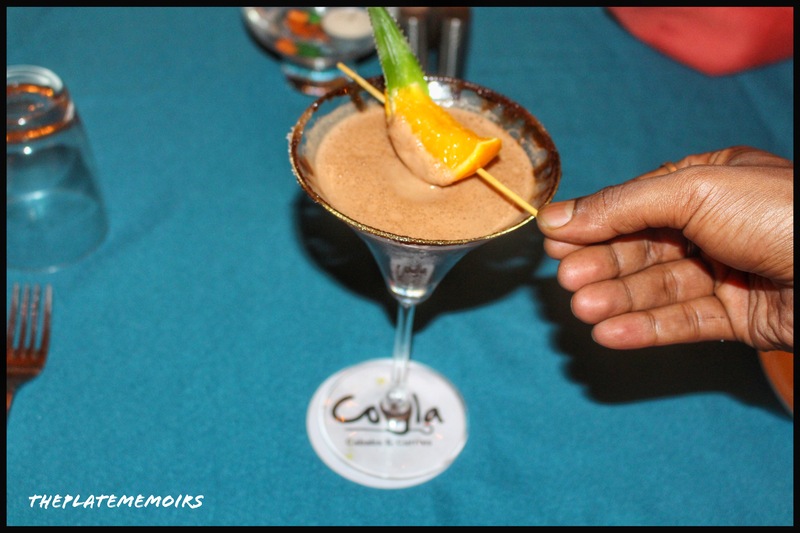 Coyla- Four Points By Sheraton, is a relatively new venture, by Sheraton. 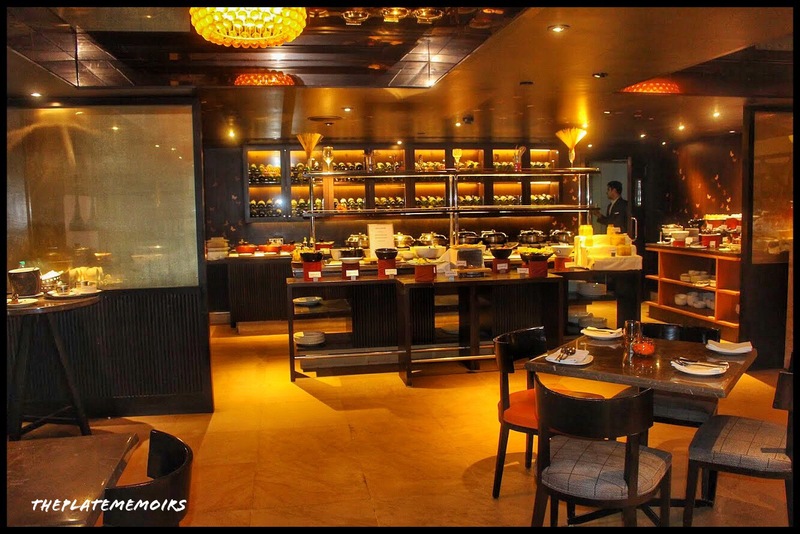 As we all know, Sheraton, is no newbie when it comes to exemplary hospitality and calibre. 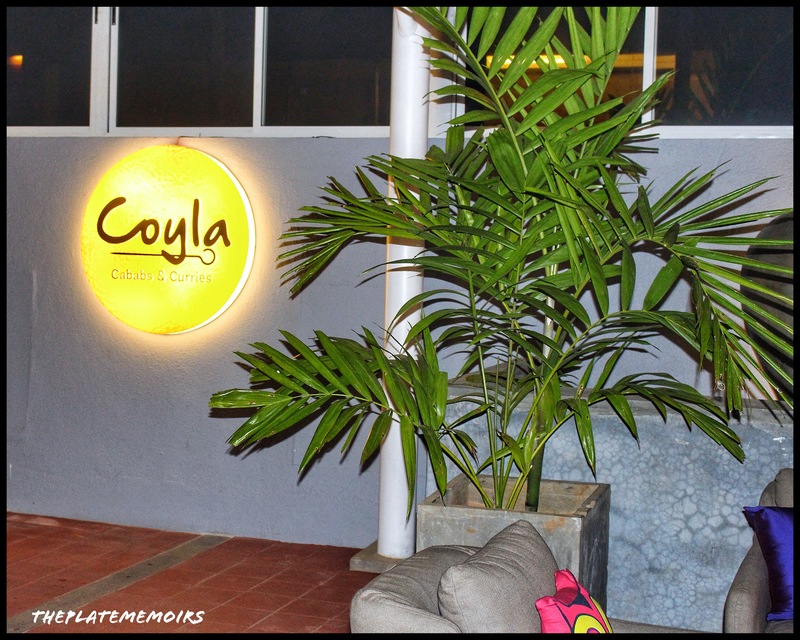 Coyla, is a beautiful rooftop restaurant which tries to caress your cares away, with its ambiance. 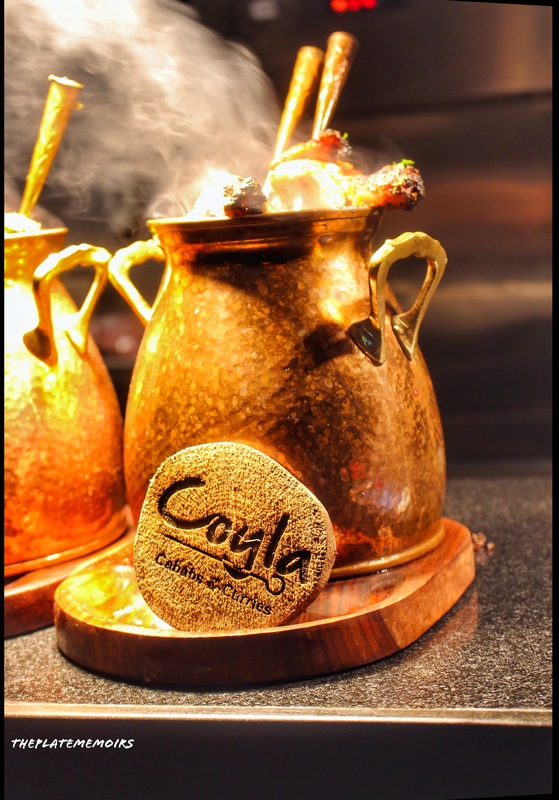 Coyla (Charcoal in Hindi), is synonymous with Indian cuisine and even more so with North Indian, Punjabi Cuisine. The Head Chef, “Mr. 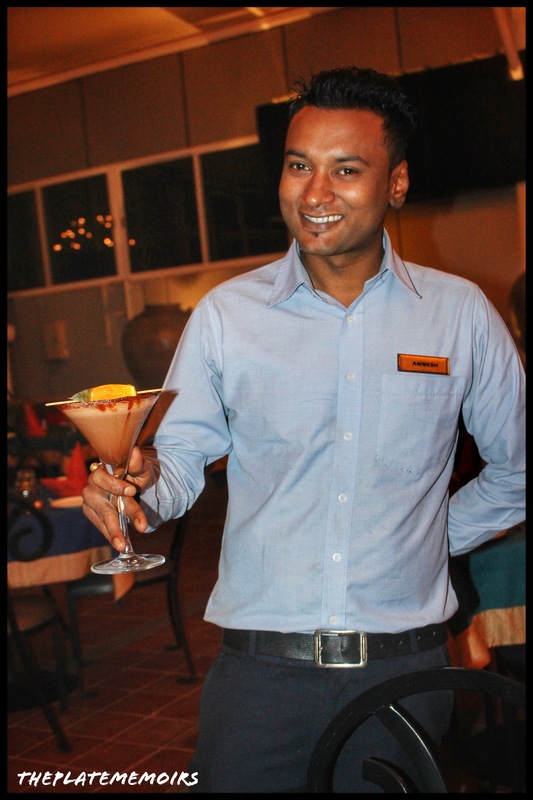 Rajesh” is a true blue Punjabi, so you can expect a hearty dose of Punjabi spices. 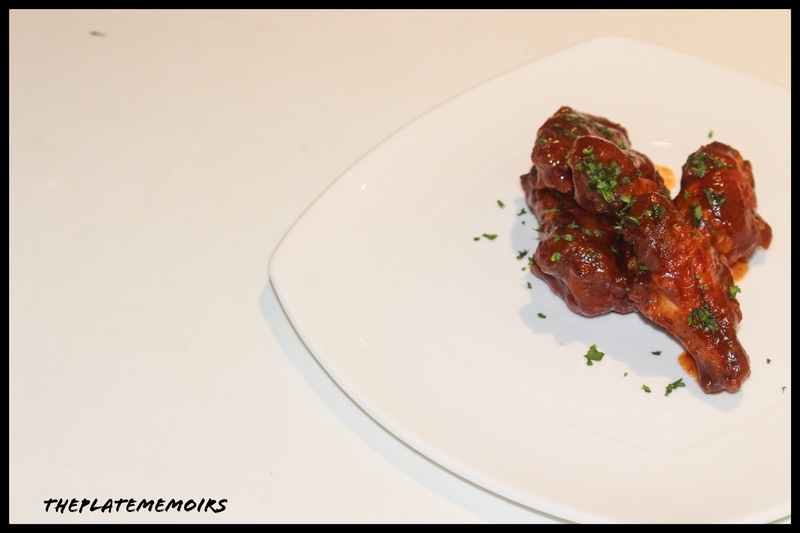 The menu, has been curated by none other than the celebrity chef, “Sweety Baluja”, himself. The ambiance is a perfect mix of rustic and calm. 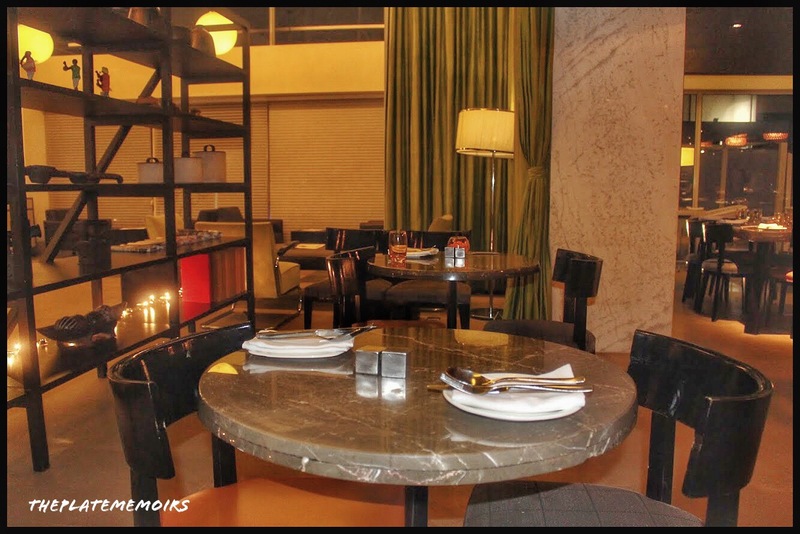 The open kitchen, let’s you gawk in awe at your food being tossed around. 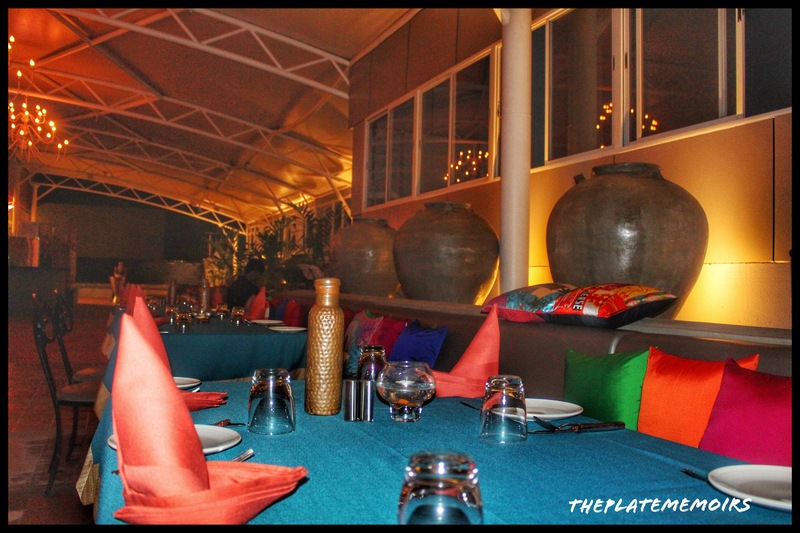 The atmosphere sets the perfect mood for a nice laid back evening and if you have that special someone- it’s romantic. I, personally loved being pampered by the staff, who are ever so attentive yet do not interfere with your dine in experience. Special mention to “Mr. Animesh”, who was a perfect host. 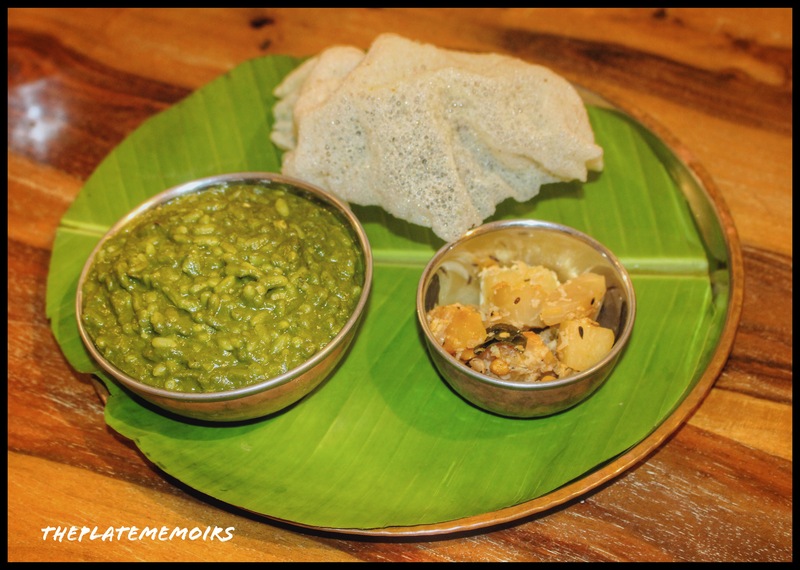 Baans aur Singhade ke Cabab (₹449/-) : A delicately in house spiced pan seared bamboo shoot and water chestnut gallette. The delectable crunch and the textural play, made this one of my favourites. Unique, yet very true to Punjabi flavours. 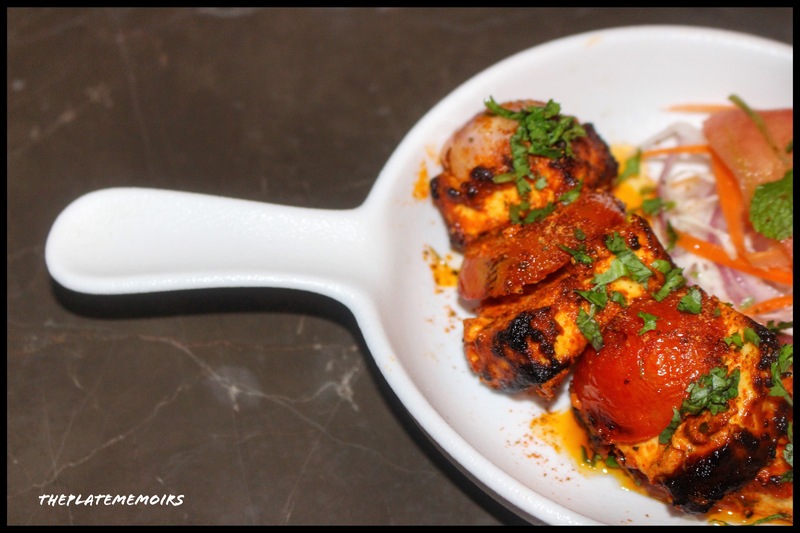 Paneer Tikka Angare (₹449/-): A fiery, spicy cottage cheese sandwich with golden garlic and caramelised onions and finished into charcoal spit. The spice level was quite high on this one. True to it’s name, it was angare alright. Sarson wali Broccoli (₹449/-) : Broccoli which was doused generously in a spicy and tangy kasundi or mustard paste and tandoored. 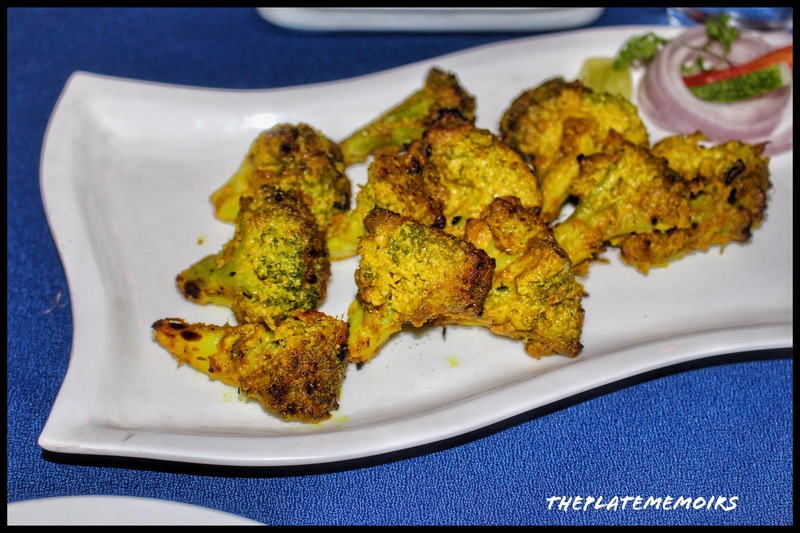 Loved the firm bite of the Broccoli, which wasn’t lost during its time in the tandoor. Murgh Tangdi Peshawari (₹549/-): This was a unanimous favourite amongst the non vegetarians. 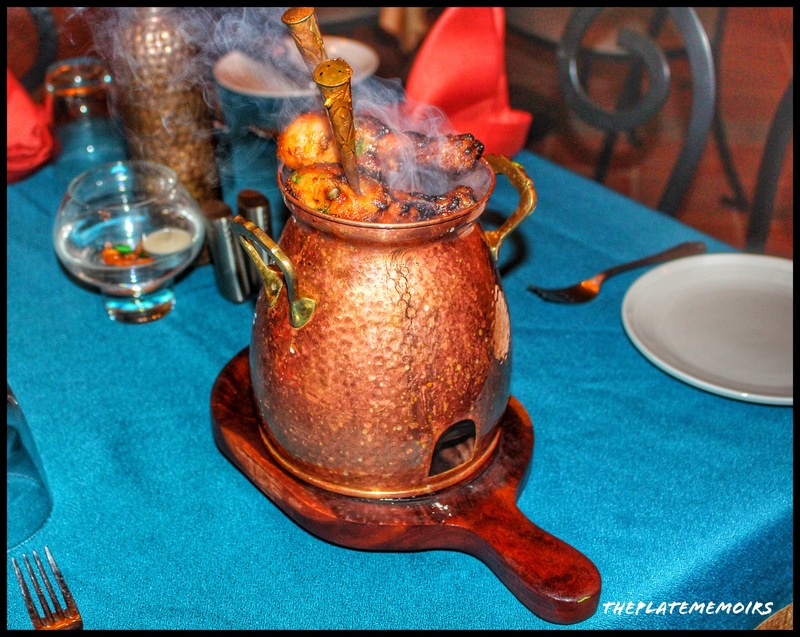 The drumsticks were sliced opened and filled with cheese and green chillies and allowed to be roasted in tandoor. What a magnificent sight to see the cheese, melt and slowly drip. 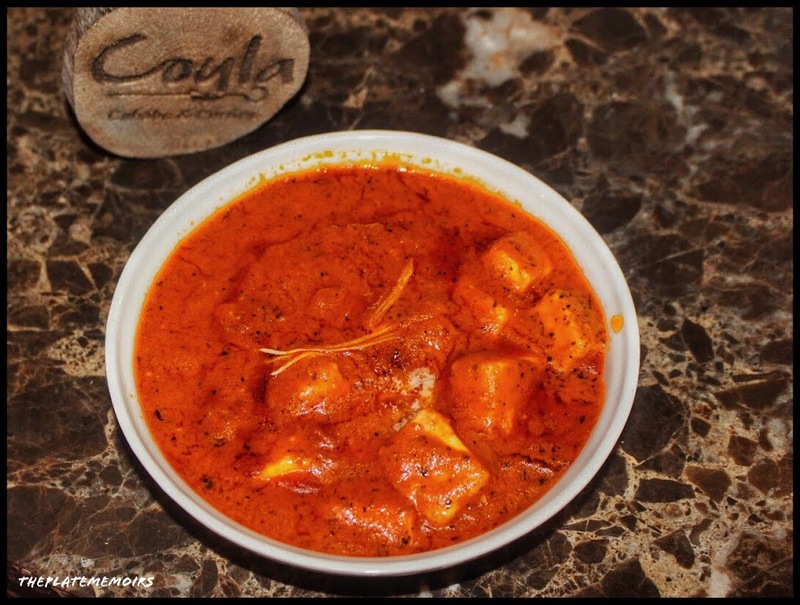 Makhanwala Ghar Ka Paneer (₹399/-) : The juicy cubes of Paneer were tossed and doused in the silky butter laden tomato based gravy. What a delight, those clean flavours were. A little tang and a lot of desi ghee love paired with a delicious warqui paratha made your day. Amritsari Pindi Chole (₹399/-) : The Pindi Chole, were good & basically the run of the mill kinds. Nothing extraordinary but yes, very homely and warm. Went great with the Taftaan. Maa Rajma Makhanwali Daal (₹349/-): Oh my goodness! I’m living for this. 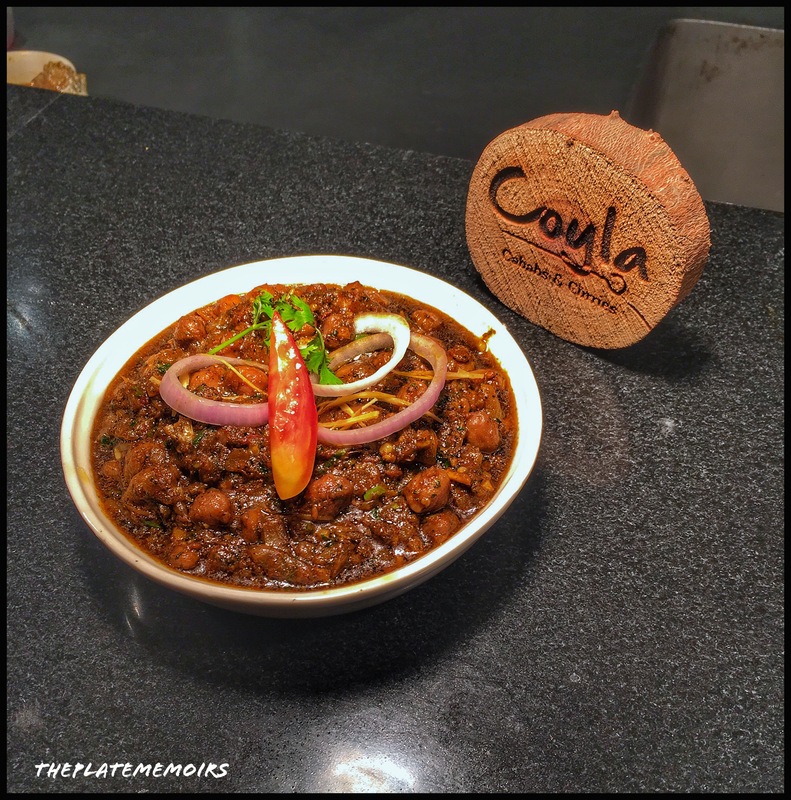 I, would love to visit “Coyla”, just for this. What clean & ambrosial flavours. When things are made in desi ghee, it just goes up by notches. Must must must try. Virgin Mojito : Something I need to cleanse palate, love it. Signature Chocolate & Grape Mocktail: What a great blend of flavours, the sourness of grapes coupled with the sweetness of chocolate & Demerara sugar! Unique & worth a try. 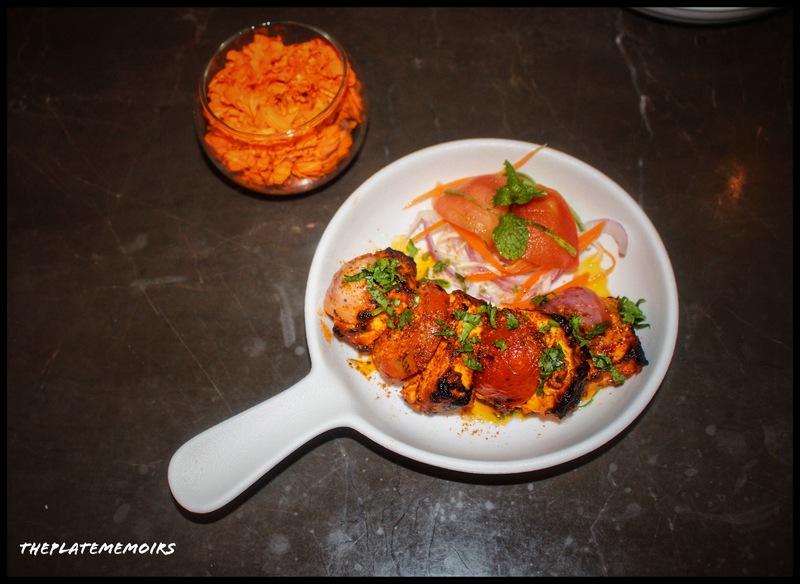 Verdict : The 3 main factors were ticked during my visit- Service, Ambiance & Food. I, enjoyed the demure evening with flavourful food. Coyla gets a 4.5/5 rating. 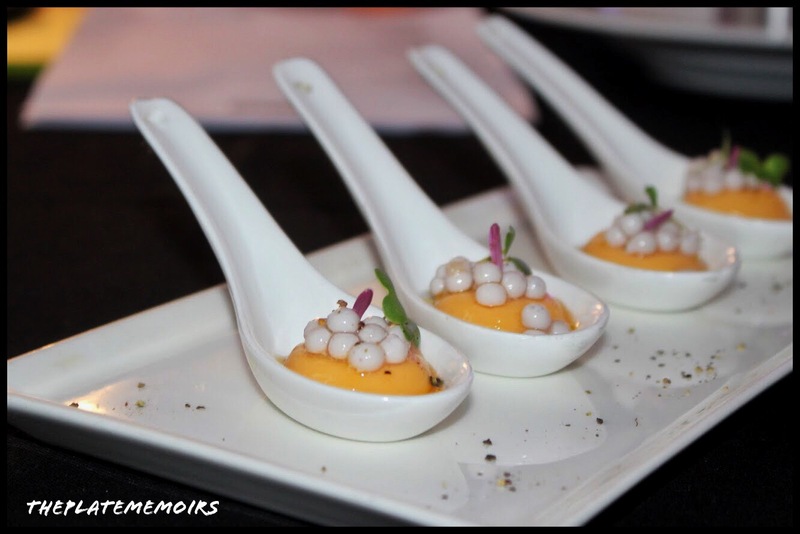 “To eat is a necessity, but to eat intelligently is an art”- Francois de la Rochefoucauld. The premise of our meet was set & we very rightfully concluded that “ A healthy, intelligent & informed decision about our day to day quick eats, plays a very important role in changing our lifestyle”. 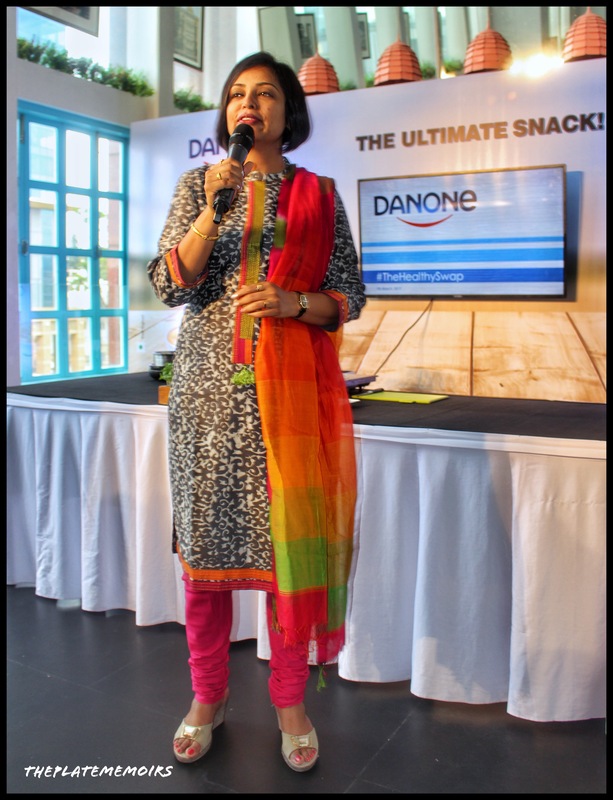 Danone Bloggers Meet, was conducted to spread awareness about the “benefits of healthy eating”. The most vulnerable a person is, is during the snacking hours. It’s a make or break situation. Irrespective of how healthy your 3 meals were, if you tend to wander off path during snacking hours, you really have gotten yourself in hot water. 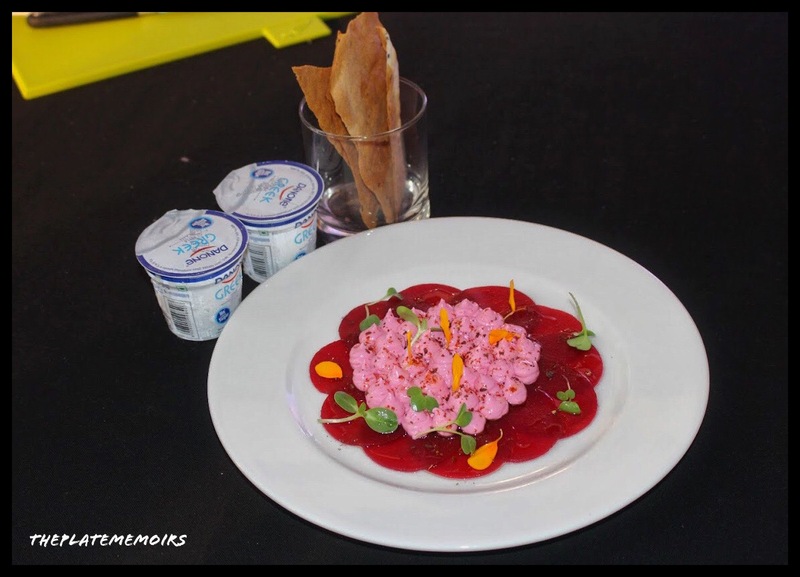 Danone, is no stranger to the world of diary & has established itself in many countries, in the past few decades. They concentrate on “Dairy”, “Early Life Nutrition” & “Medical Nutrition. What makes them stand apart from all the competition, is their “Sustainability ” ethics. Staying true to its motto “One Planet. 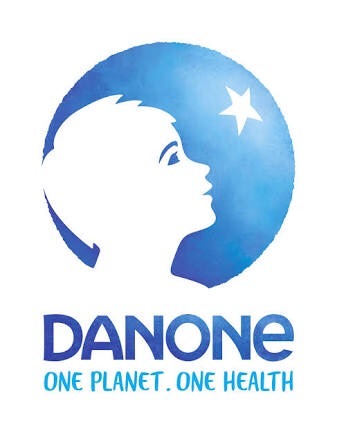 One Health”, Danone had a campaign running, called as “The Healthy Swap”, which captures the very essence of Danone’s motto. 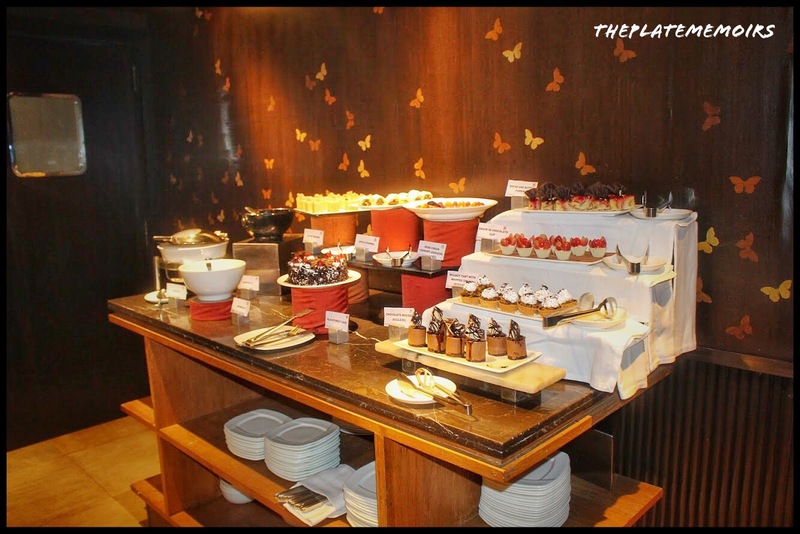 Our meet, took place at “Fava- Mediterranean Bar & Restaurant” at UB City. We had “Ms. Shefali Sapra” Director Corporate Affairs, with her effervescent presence, enlighten and walk us through the brand and its ethics. 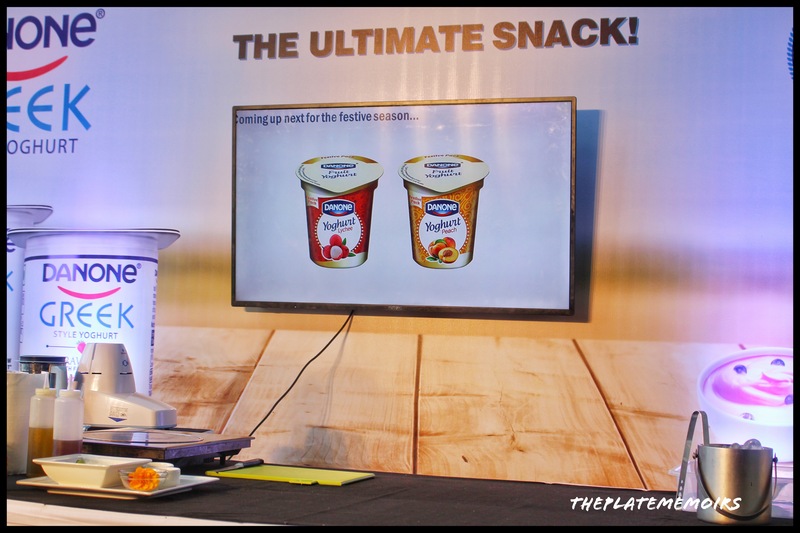 She also, unveiled the 2 new yoghurt products, that will be hitting the market and shelves very soon. We were then, given an interactive session with “Dr. 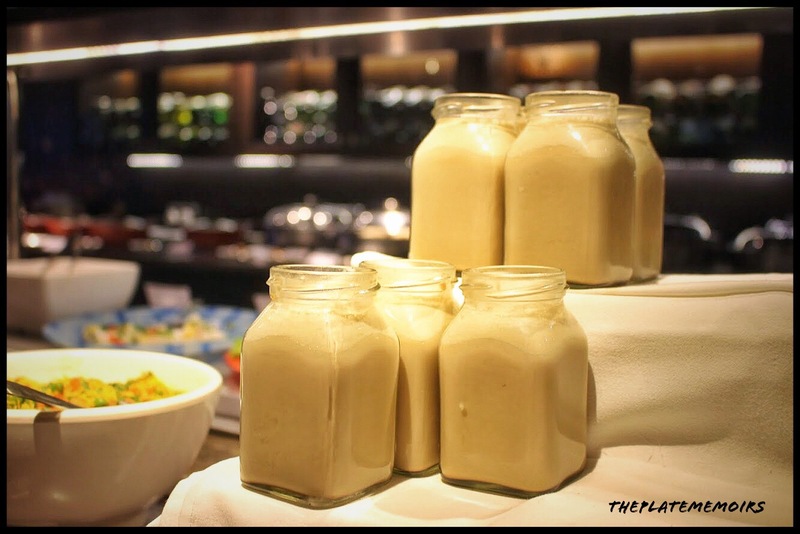 Madhavi Marathe” Senior Nutritionist, who went on to explain the basics of nutritional deficiencies, we face and how incorporating something as simple as yoghurt in your life, makes a difference. She emphasised about the necessity to recognise the need to eliminate “mindless snacking”’and replacing it with “mindful snacking”. 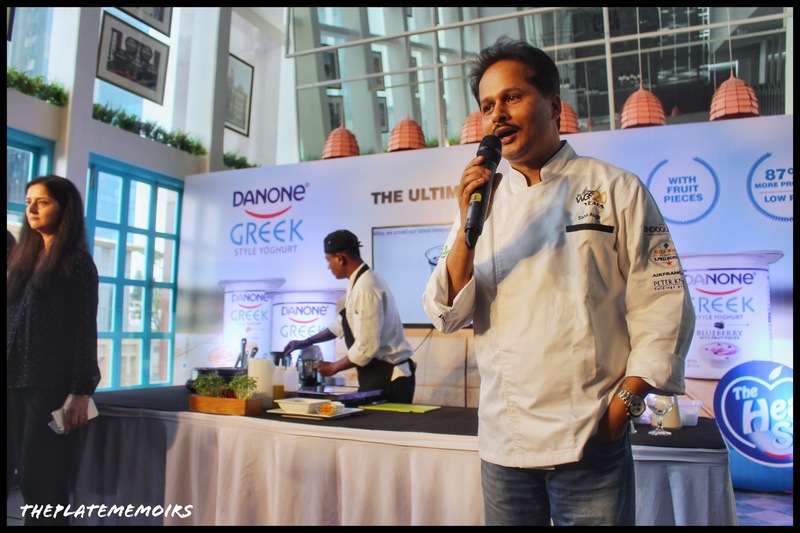 At last, we were given a cooking demo, by none other than “Chef Abhijit Saha” himself, where he used Danone’s Greek yoghurt to make dishes that had us drooling even after we went back home. 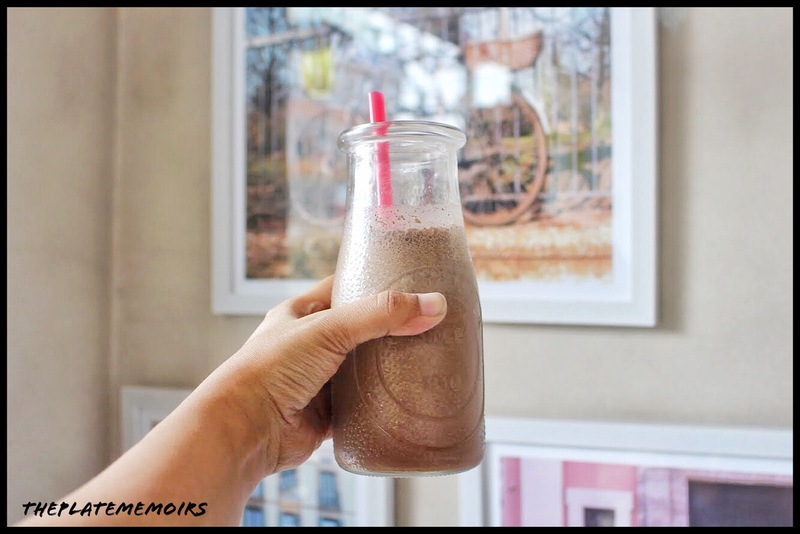 Super Food Smoothie : This was a blend of Danone Greek Yoghurt, papaya, spirulina powder, alfalfa powder & wheatgrass powder. 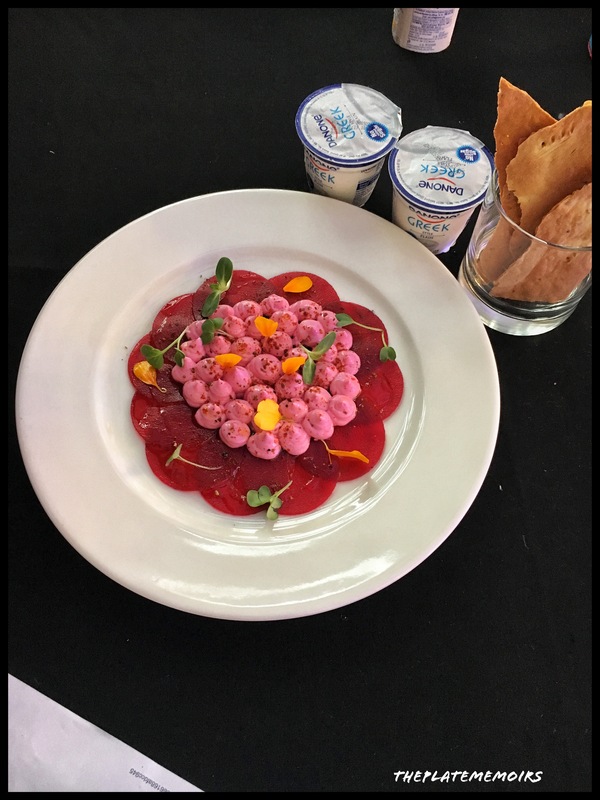 Beetroot Carpaccio with Beetroot Labneh : Pickled Beetroots with Labneh infused with roasted Beetroot purée. Mango Yoghurt Spherification with blueberry yoghurt & Feta caviar: Using the technique of spherification to encapsulate the yoghurt & create faux caviar. What a delight to watch. 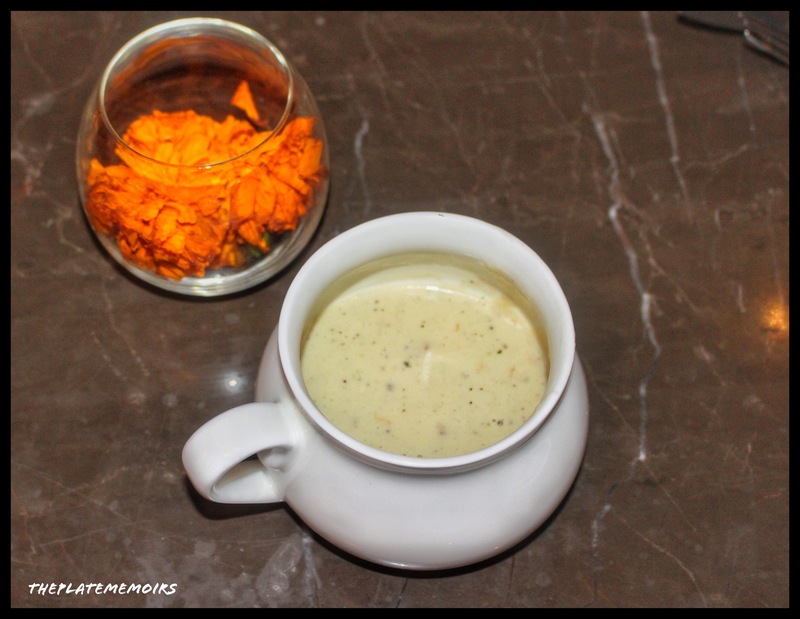 Chicken & Yoghurt Soup: A warm, sour yet flavourful chicken soup. 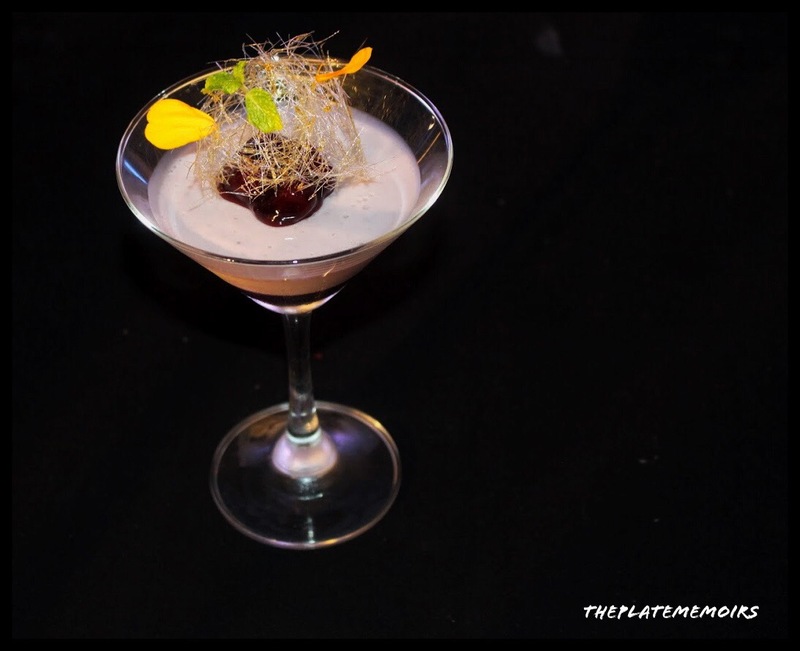 Blueberry Panacotta with blueberry compote: The much loved Panacotta made in minutes, with some sweet and sour blueberry compote & spun sugar. 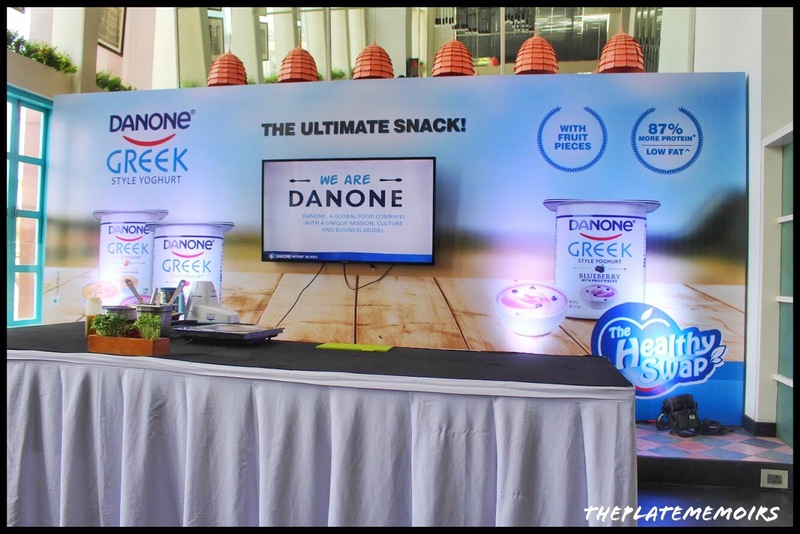 Danone’s Greek Yoghurt, was the main star of the event and here are a few pointers that were given to us, by the team. Danone’s Plain Greek Yoghurt has no added sugar. 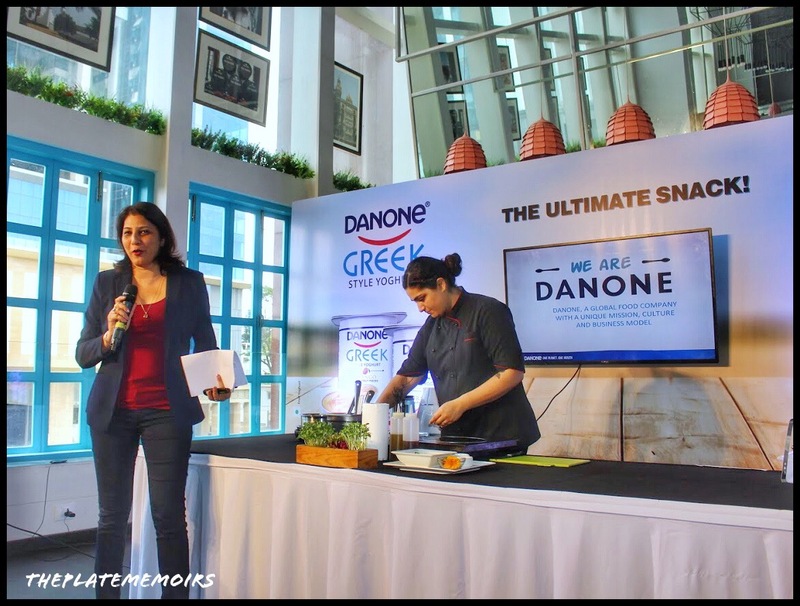 Danone’s Greek Yoghurt, is made with the best of milk, that is sourced from local dairies. 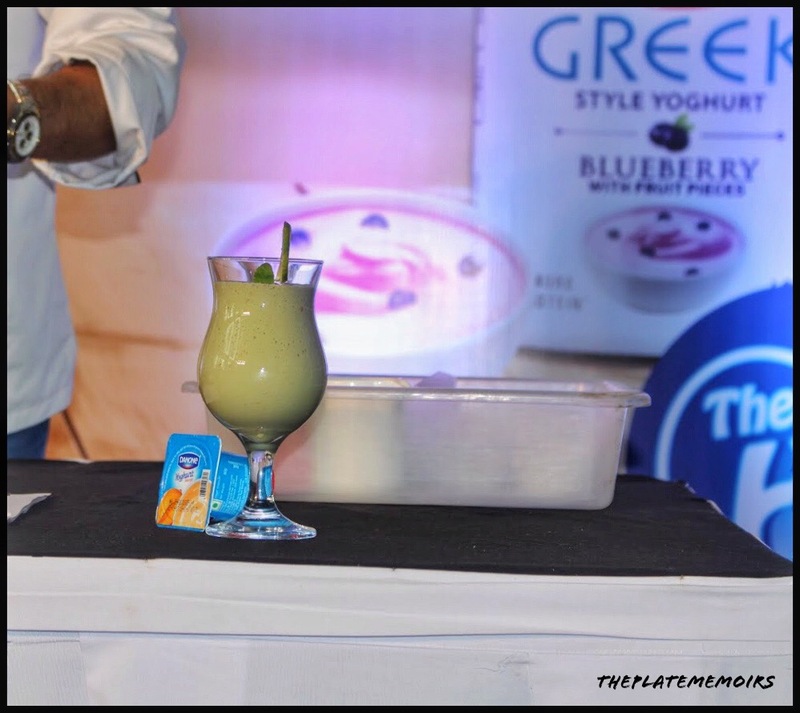 Danone’s Greek Yoghurt, is much thicker and healthier than the normal yoghurt. Danone Greek Yoghurt has 87% more protein than normal yoghurt. The meet was very informative, interactive and prompted all of us to take up #thehealthyswap . And how true does that message of empowerment sound? We all vow, to go eco, go green, blah blah..blah! But, how many times do we really take a small step towards doing something for the environmental betterment and make eco-friendly lifestyle changes, which stay put not for a month or two but for a lifetime? Not many..
Umm.. no! Buying an eco friendly deodorant doesn’t count as “Going Green”. So, this other day, my luck gave way and I had an experience which will sit with me, for quite sometime. I, chanced upon this gem named “Go Native”. Go Native, stand by their motto “Eat, Play & Live Sustainably”. That very motto, resonates with each and every element of “Go Native”. 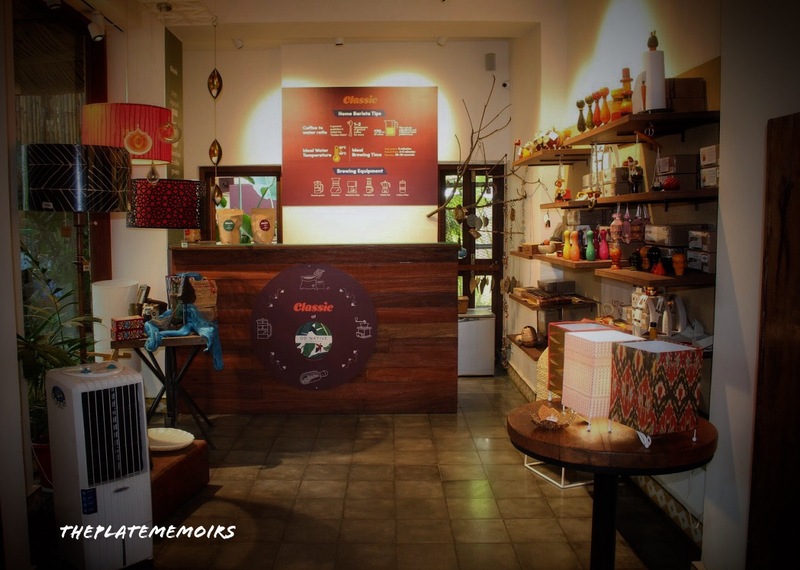 You are welcomed by refurbished furniture, displays of organic food, organic cosmetics, handloom weaves, handicrafts and books. It really is a sanctuary within itself. It’s the concept that bowled me over. The ground floor, is dedicated to the theme of Play & Live sustainably and the first floor is dedicated to eating sustainably (there is some retail therapy here as well) . 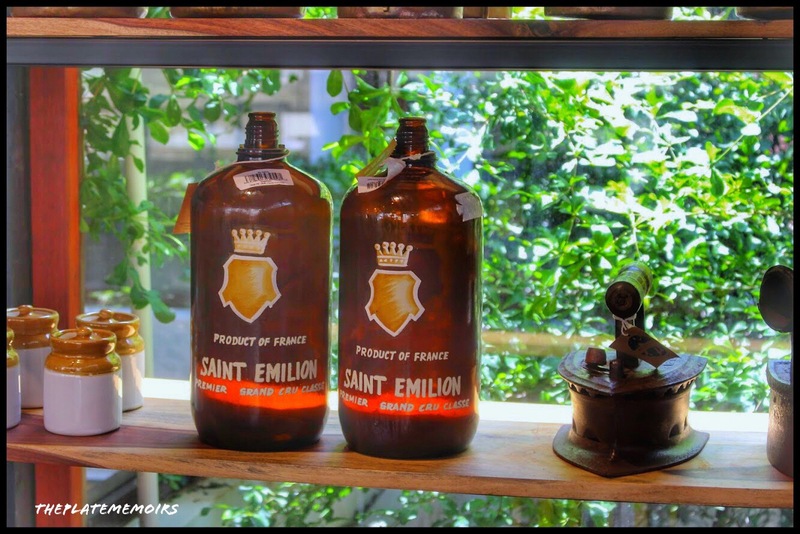 It’s a perfect souvenir shop, to pick up your curios, mementos or to really redesign your living with their upcycled goodies. The food is sourced from organic sources and they follow the simpleton module “Farm to Table”, where they directly procure and quality check each and every element which goes into their food. Even the menu, is made out of recycled paper. 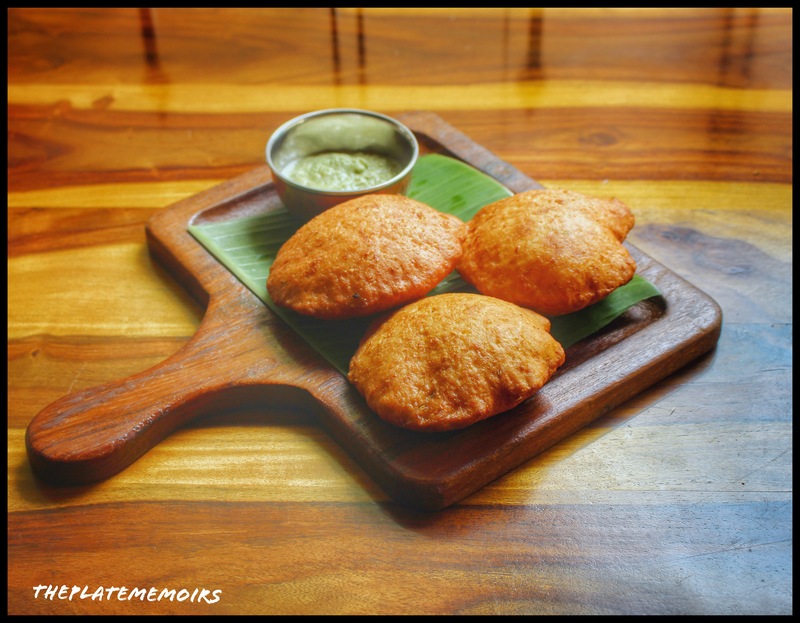 The menu is extensively Karnataka with a few influences from neighbouring states. I’m guilty of being superfluous with my language to describe how much, I love this place. 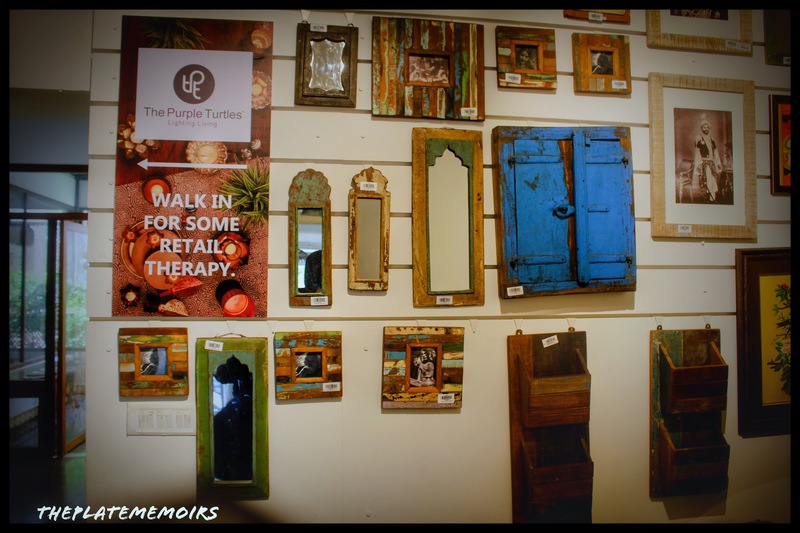 It’s quirky, a haven, a sanctuary, a treasury for all good things. The ambiance is unmistakably rustic and peaceful and if you’re with the right person, very romantic as well. My review, would be of no use if I miss out on our hostess of humble disposition- Miss. Anvita, who is a charming young lady with very strong and dedicated ideals. The staff is well groomed and are nimble on their feet. Now, we are talking.. Aren’t we? 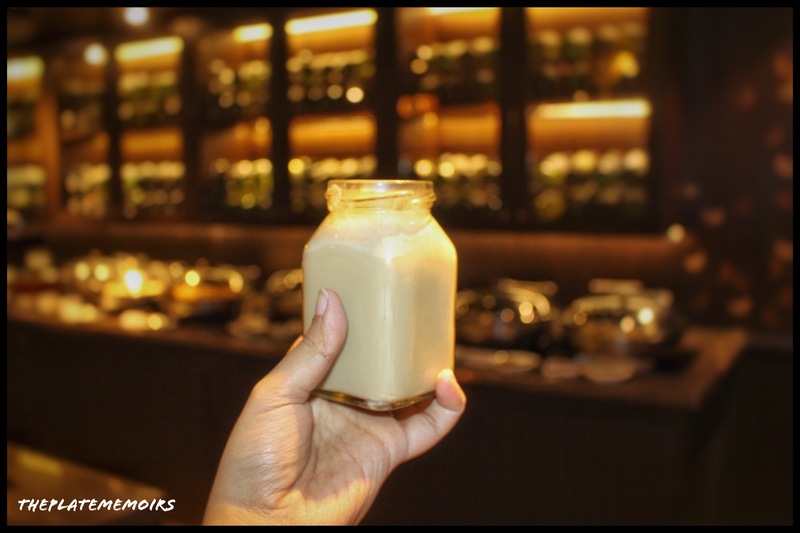 Drinks : They have a splendid selection of Teas, Coffees, Cold Pressed Juices and smoothies. The teas are from the well known organic brand “Teabox”. 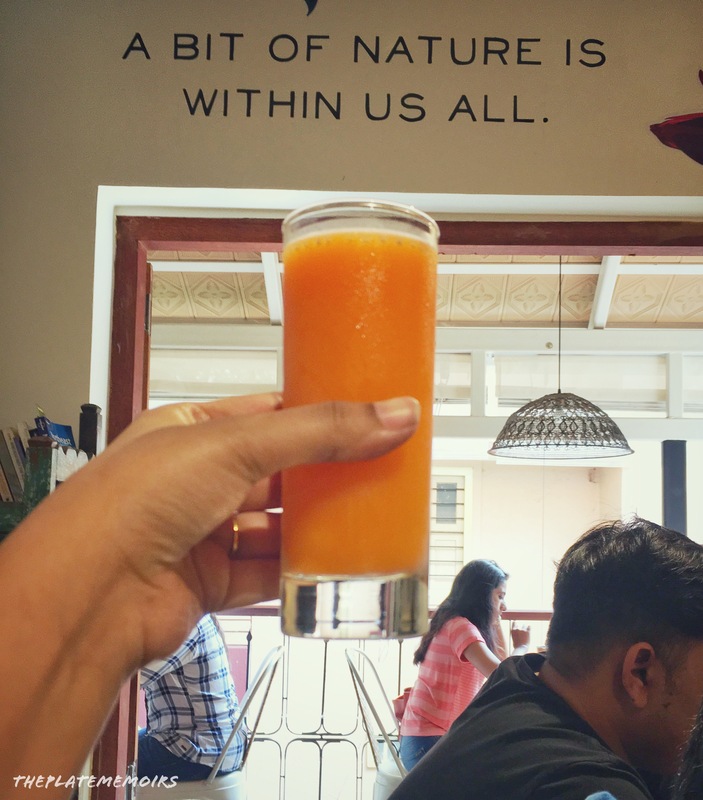 Vitamin Booster (₹150/-) : A medley of carrot, lime, parsley, chia seeds, orange & tender coconut. Super healthy and if you’re in the healthy living sphere, you will love it. 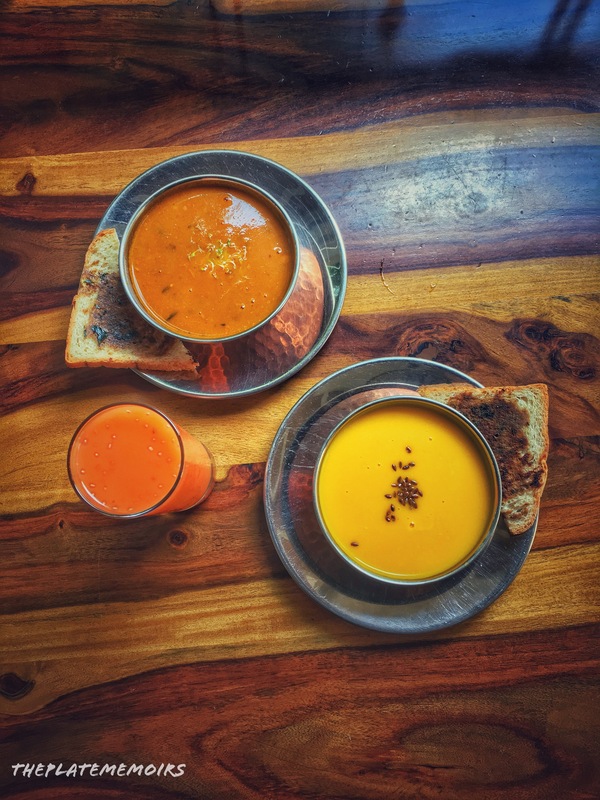 Carrot, Coconut & Ginger Soup (₹95/-): Perfect for a beautiful rainy day, with the heat of spices warming you up. 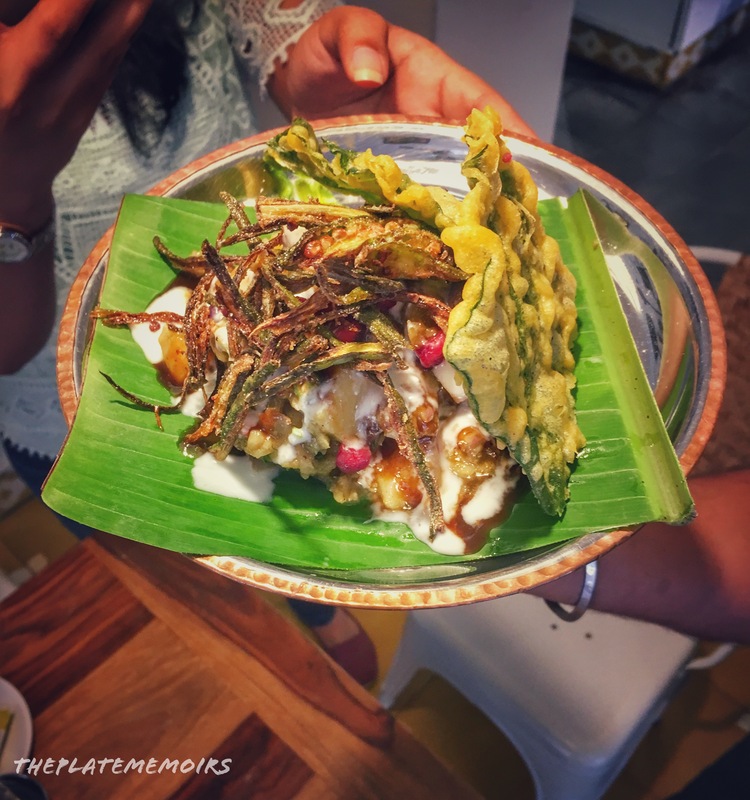 Aloo Patha Bhindi Chaat (₹125/-) : A Melange of flavours, bursting with harmony. 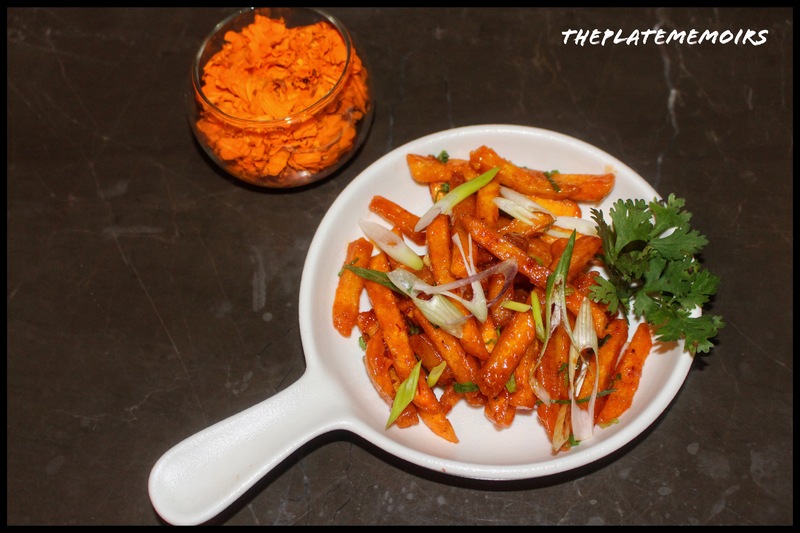 This is a true Indian street food, definition but with a healthy twist. 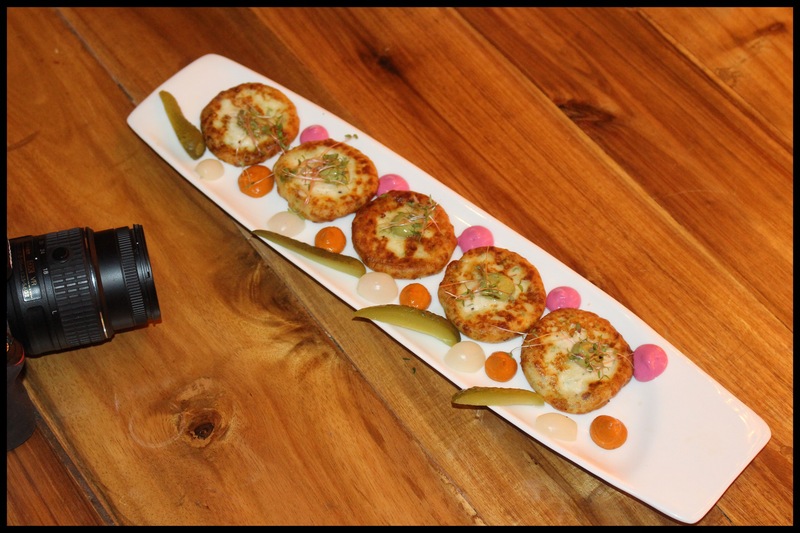 It has potato cubes, delectable thick yogurt, mint and tamarind chutney and crispy spinach leaves with crispy okra. 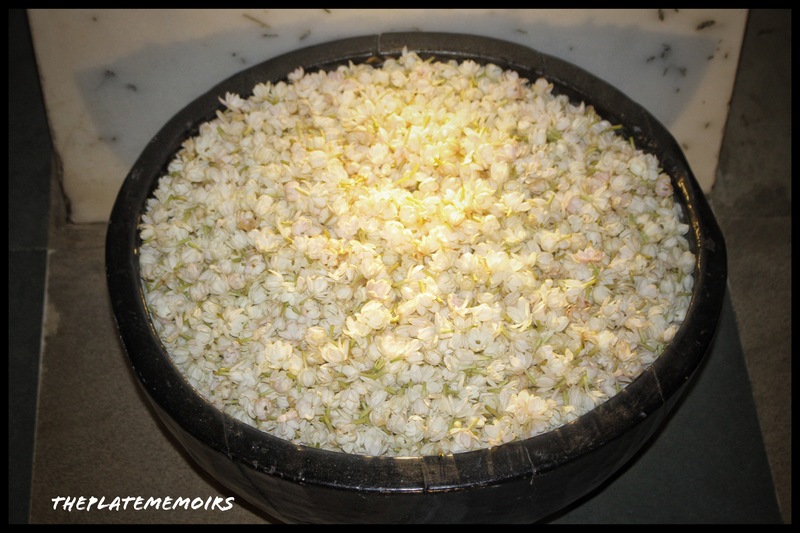 Each flavour stood out as it enveloped your senses in a happy mood. 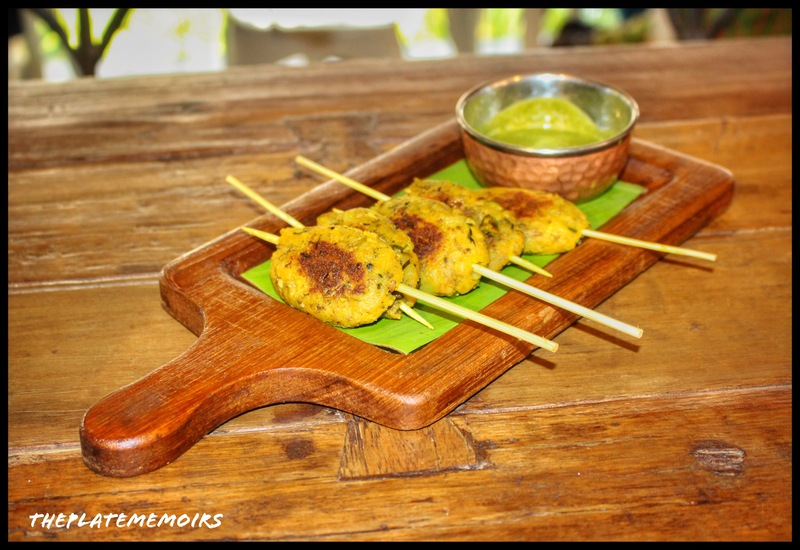 Banana Flower Baked Skewers (₹145/-): Quite a nice textural play over there, with a mushy as well as grainy texture to titillate your taste buds. Went really well, with the chutney it came with. Palak Khichdi (₹160/-) : A delectable dish made out of red rice, puréed spinach and raw papaya salad. The red rice was soaked so well with the spinach purée, it seemed like the match was made in heaven with perfect balance of flavours. The dish heroed “Spinach” & that’s exactly what I wanted. Masala Jolada Roti Yangai (₹160/-): The soft sorghum flatbread flavoured with masalas and served with a delectable Aubergine curry & sprouts salad, was yet another feather in the cap. Who said healthy isn’t delicious? 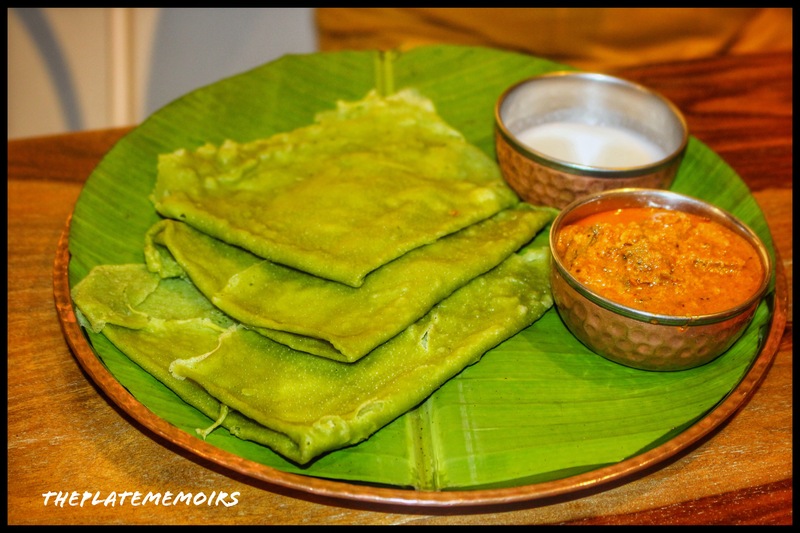 Soppu Neer Dosa (₹160/-) : A paper thin crepe (Dosa) made out of spinach and served with coconut gassi, made quite a mark. A little more thinner would’ve been taken this up by a notch, but I’m not complaining. Ragi Pizza (₹180/-): Yes, the Finger Millet Pizza, was just as good as any other thin crust pizza. It had more texture and the toppings were so generous. Just this, on its own is filling. 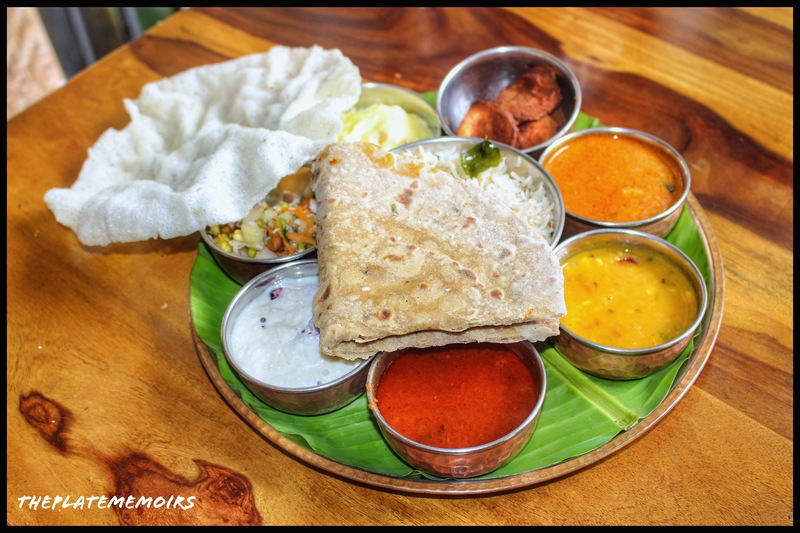 Go Native special Thali (₹200/-): An assortment of roti, pappad, rice, veg curry, salad and palya. 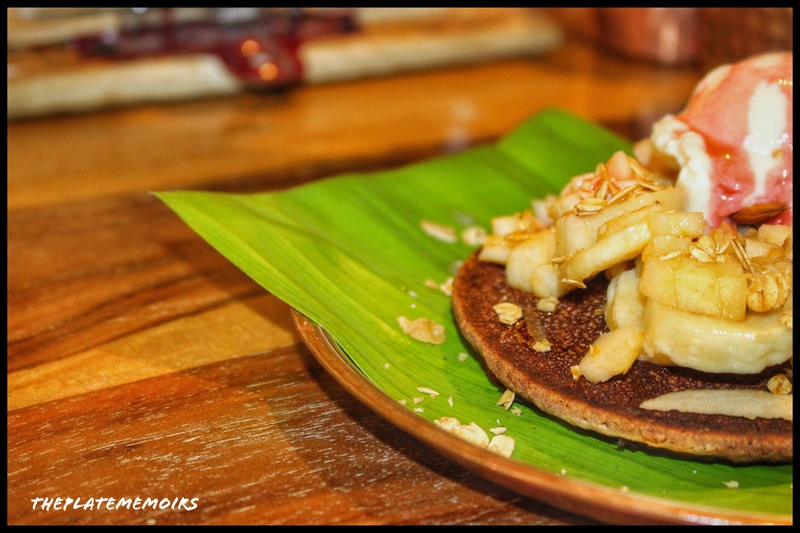 Millet Pancakes (₹150/-) : Ragi pancakes, served with banana, vanilla ice cream and muesli. This one, again was one of my favourites. Do make sure that you consume it as soon as it arrives. The softness retains or else, you will have to prepare yourself, for a war along with your artillery against the pancake. 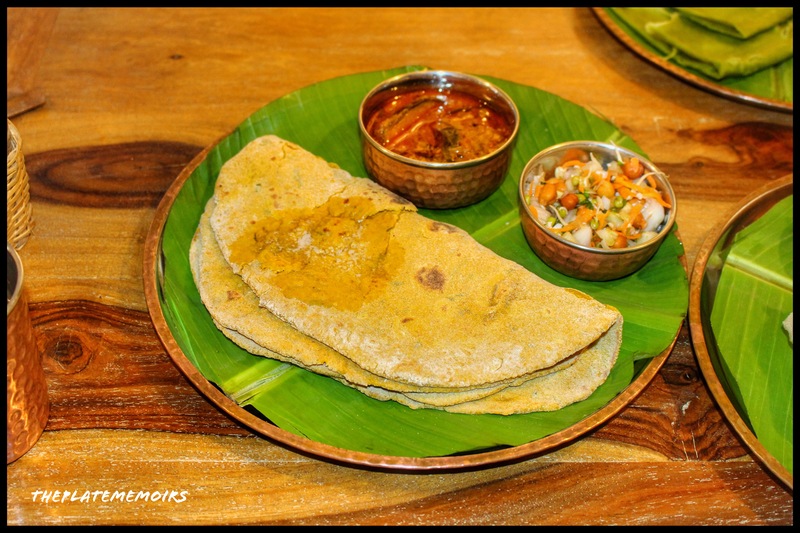 As the nachni/ragi/ Finger millet in the pancake, will harden it up the longer you leave it untouched. Verdict : This place, is just an amazing little wonderland, I love the fact that it’s one of those “guilt free” institutions that advocate and promote “The 3R’s” , “Reduce,Reuse &Recycle”. You feel good, for whatever choices you made for visiting this store. Do check their organic food section. I’m in love with the “HUDA Vegan Bars” over here. The food as well, is rustic and has a keen eye for “Nutritional value”.